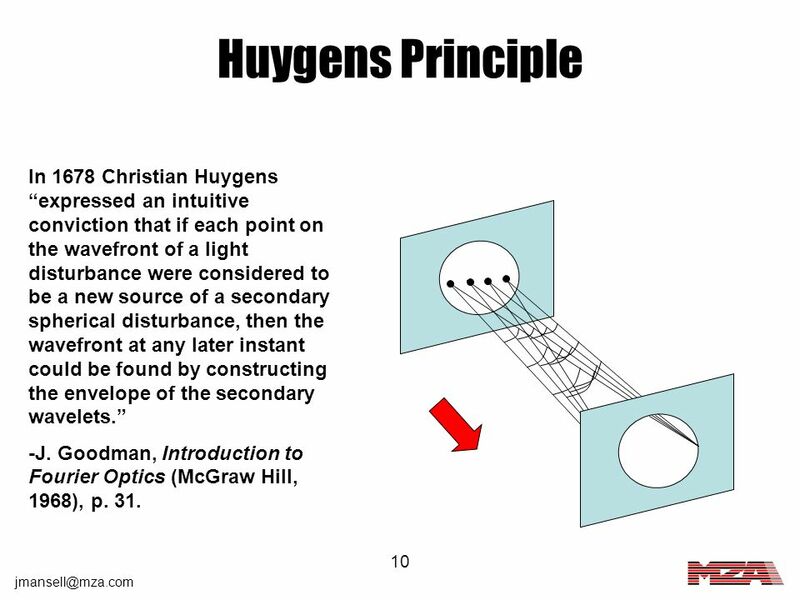 10 Huygens Principle In 1678 Christian Huygens “expressed an intuitive conviction that if each point on the wavefront of a light disturbance were considered to be a new source of a secondary spherical disturbance, then the wavefront at any later instant could be found by constructing the envelope of the secondary wavelets.” -J. Goodman, Introduction to Fourier Optics (McGraw Hill, 1968), p. 31. 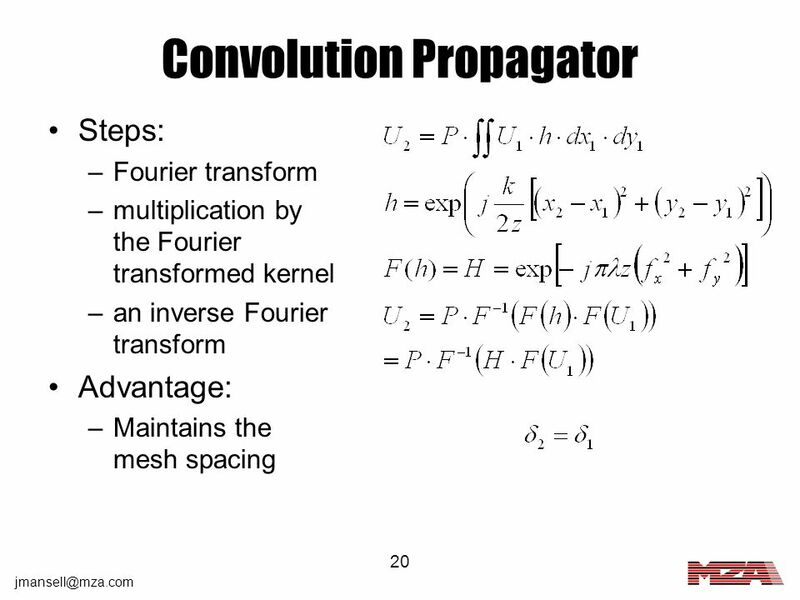 One drawback of the convolution propagator is its apparent inability to scale the mesh spacing in a propagation. 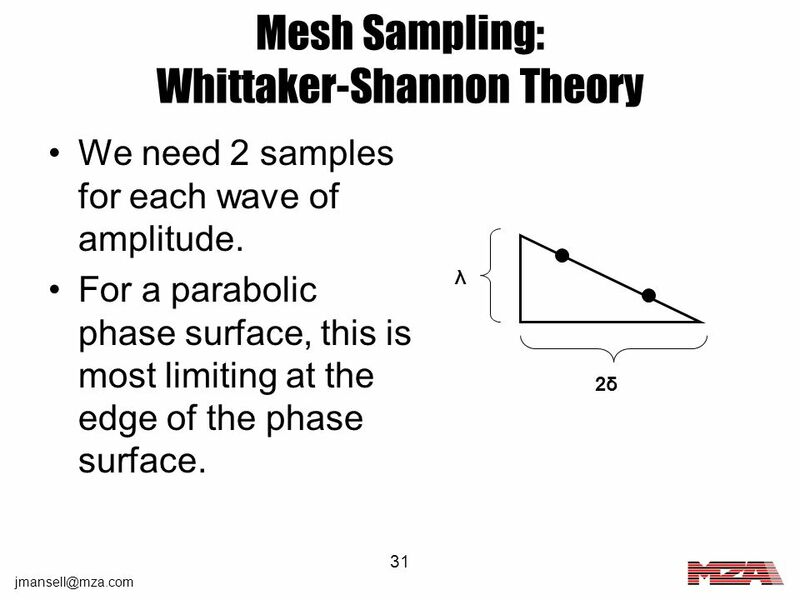 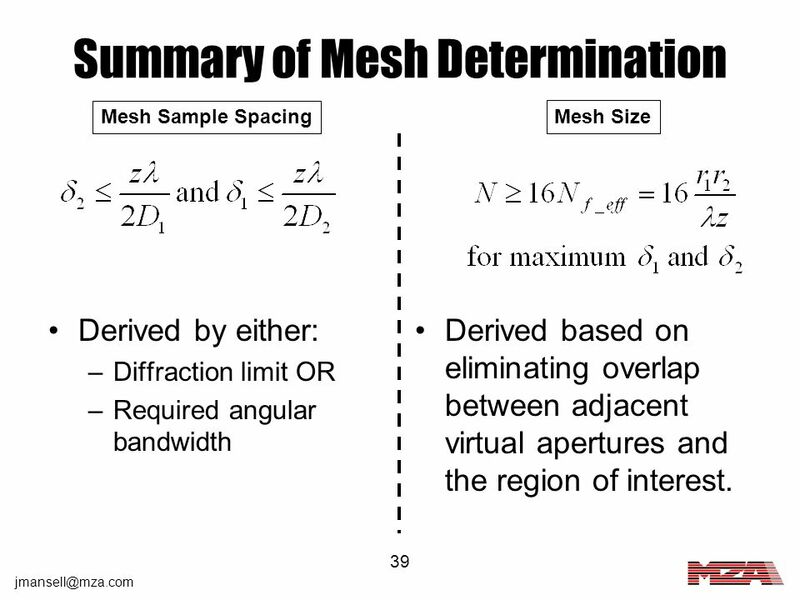 Scaling the mesh is important when propagating with significant wavefront curvature. 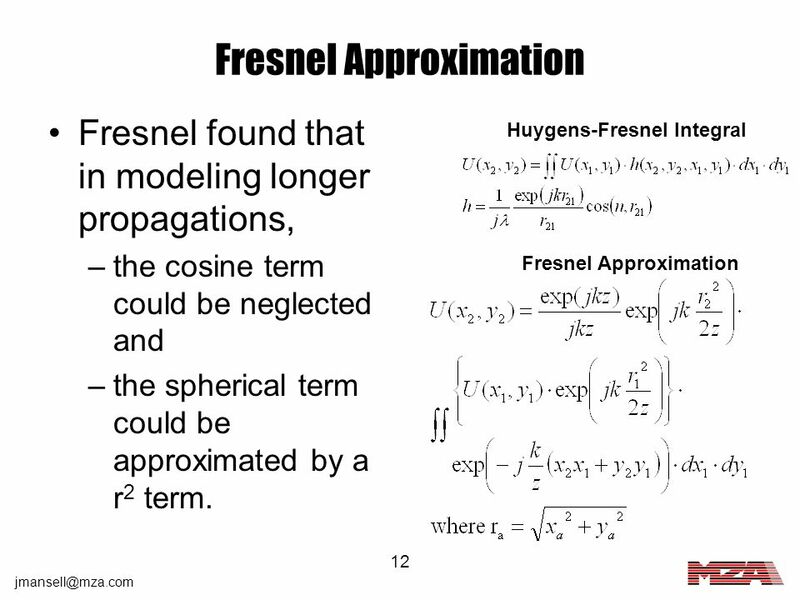 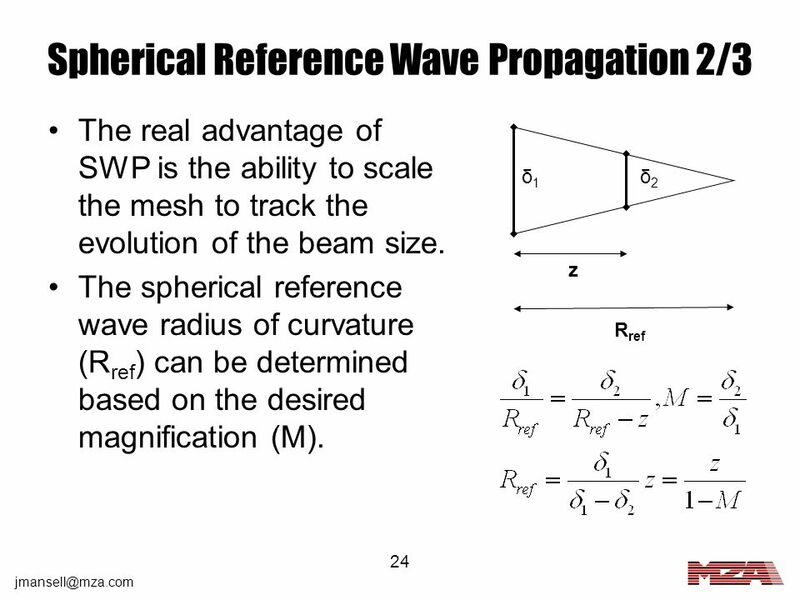 The convolution propagator can be modified to model propagation relative to a spherical reference wavefront curvature such that the mesh spacing can follow the curvature of the wavefront. 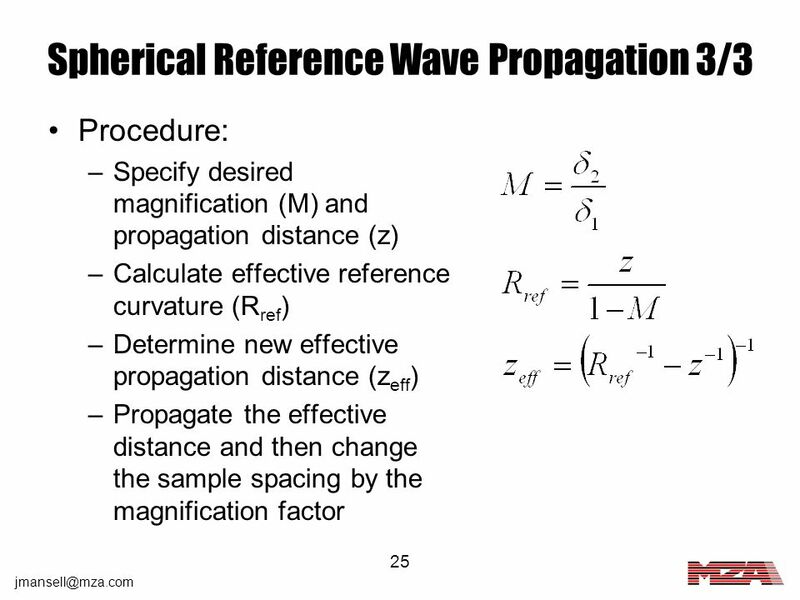 We call this Spherical-Reference Wave Propagation or SWP. 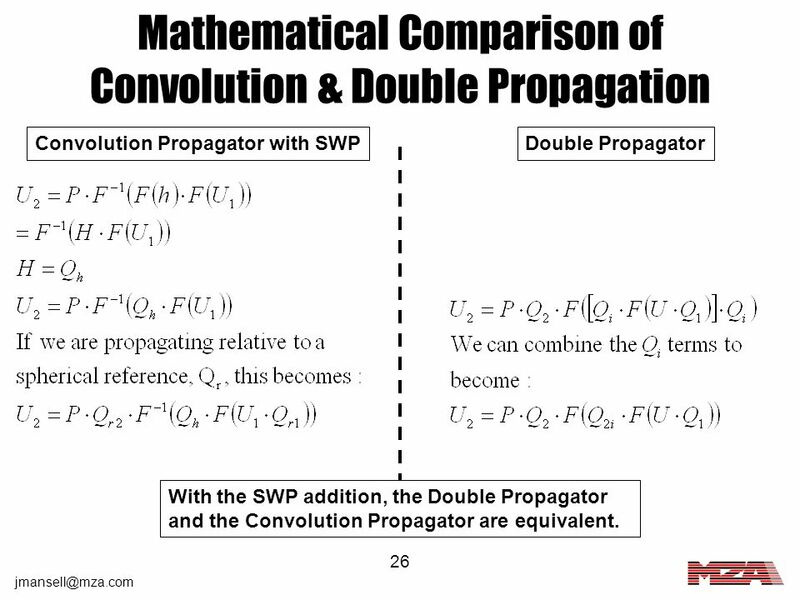 Convolution Propagator with SWP Double Propagator With the SWP addition, the Double Propagator and the Convolution Propagator are equivalent. 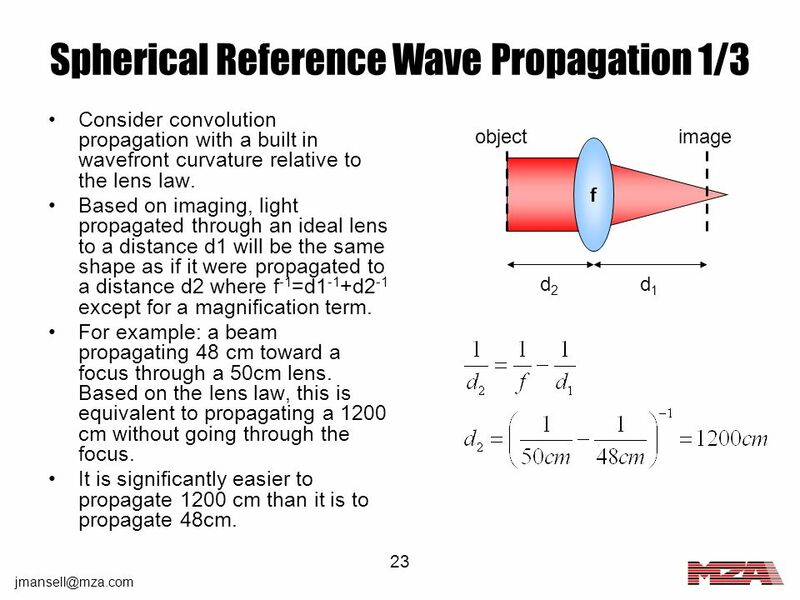 27 Conclusions We use the convolution propagator in WaveTrain with spherical-reference wave propagation. 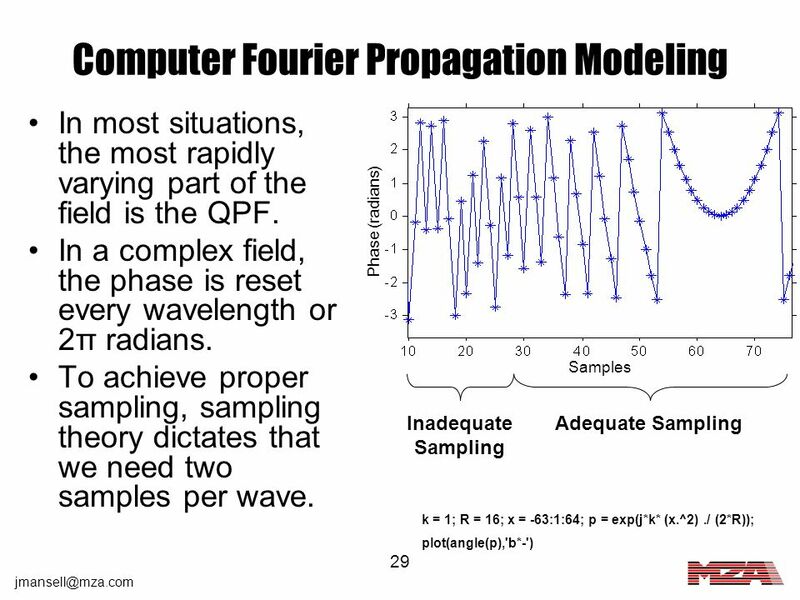 This allows us to solve any general wave-optics problem. 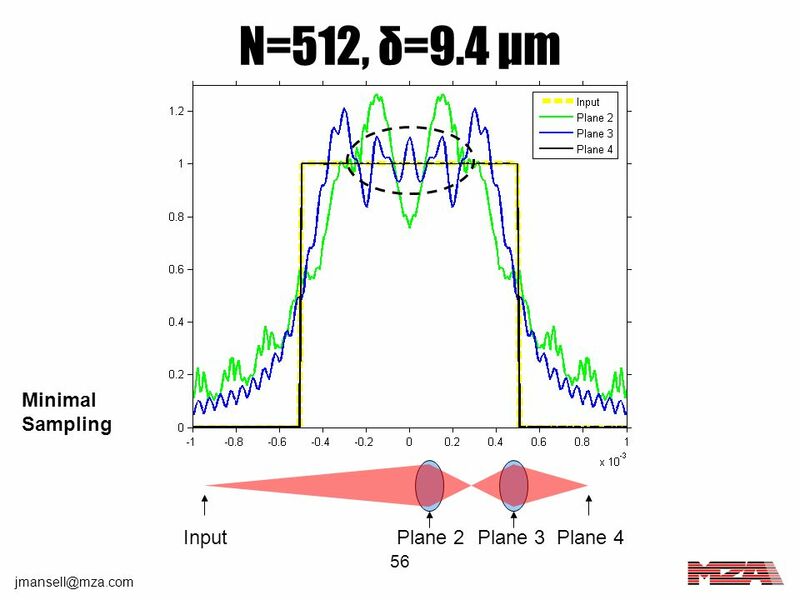 Now that we know the mesh sampling intervals (δ1 and δ2), we need to know how big a mesh we need to use to accurately model the diffraction. 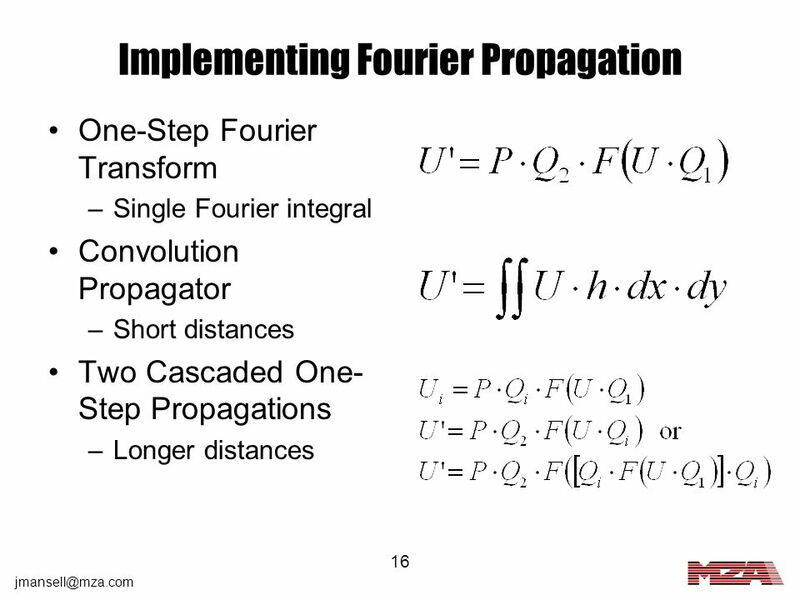 The Fourier transform assumes a repeating function at the input. 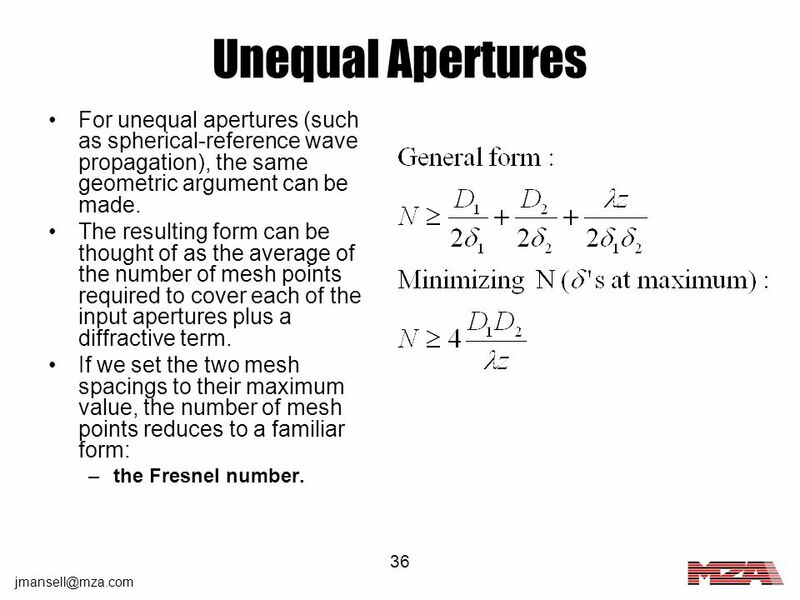 This means that there are effective virtual apertures on all sides of the input aperture. 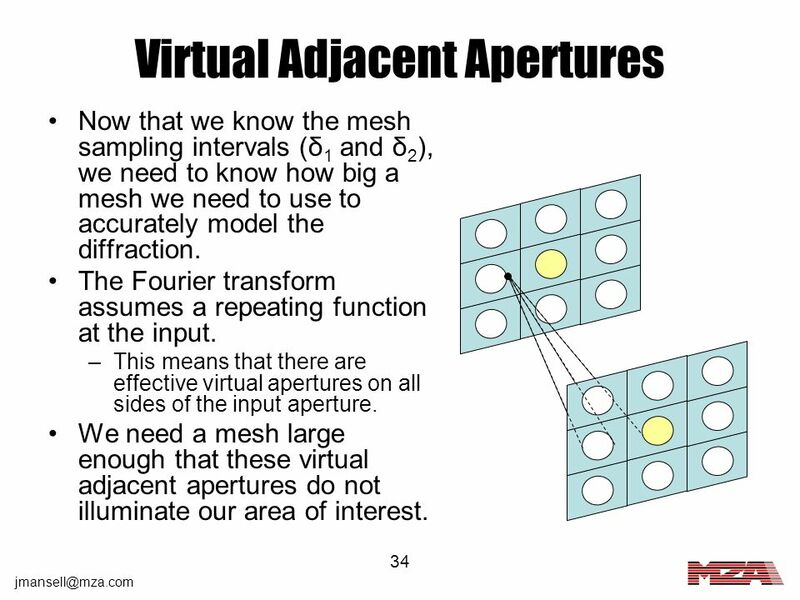 We need a mesh large enough that these virtual adjacent apertures do not illuminate our area of interest. 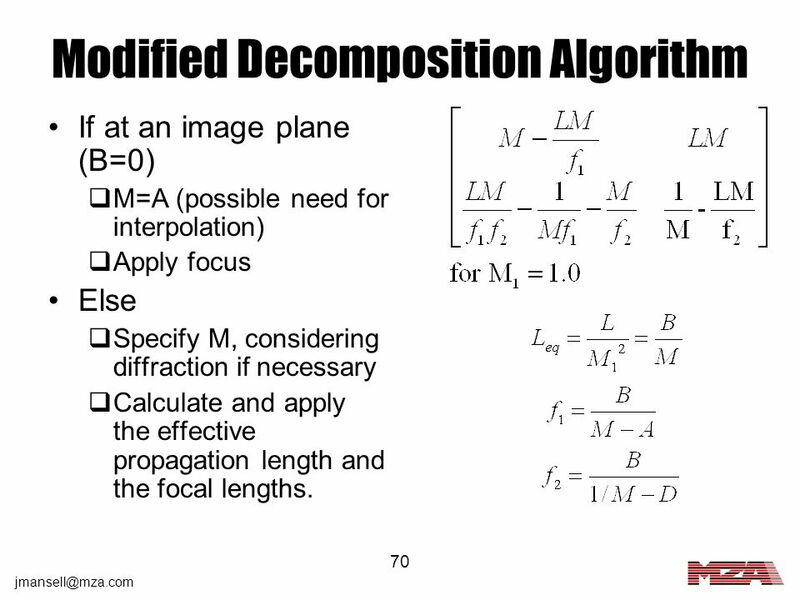 D+θz D z Dup Ddown To avoid adjacent apertures (Dup and Ddown) from interfering with the output area of interest, the modeled region should be D+θz in diameter. 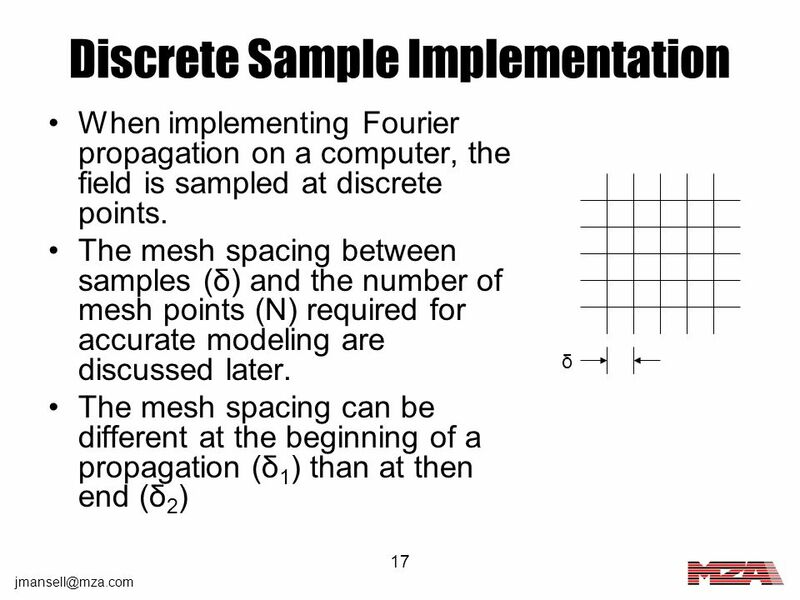 This means that the number of mesh points should be this diameter divided by the mesh spacing (δ). 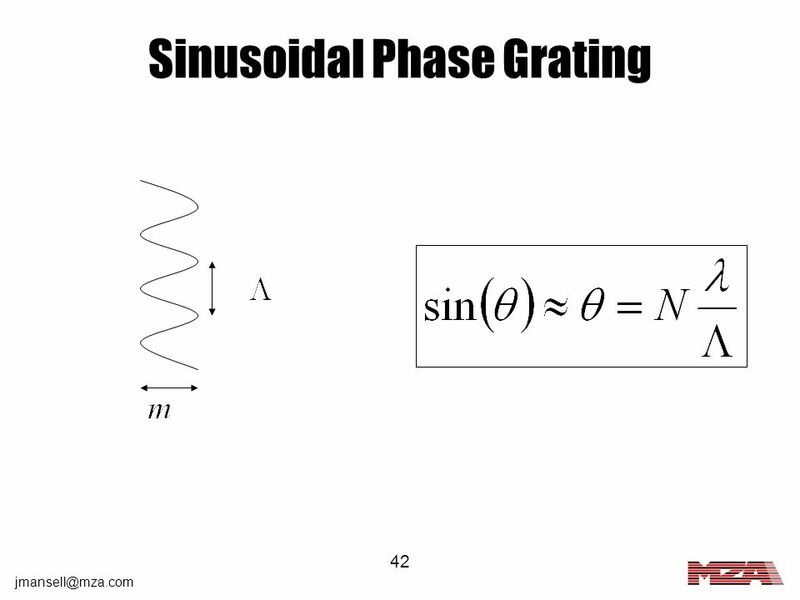 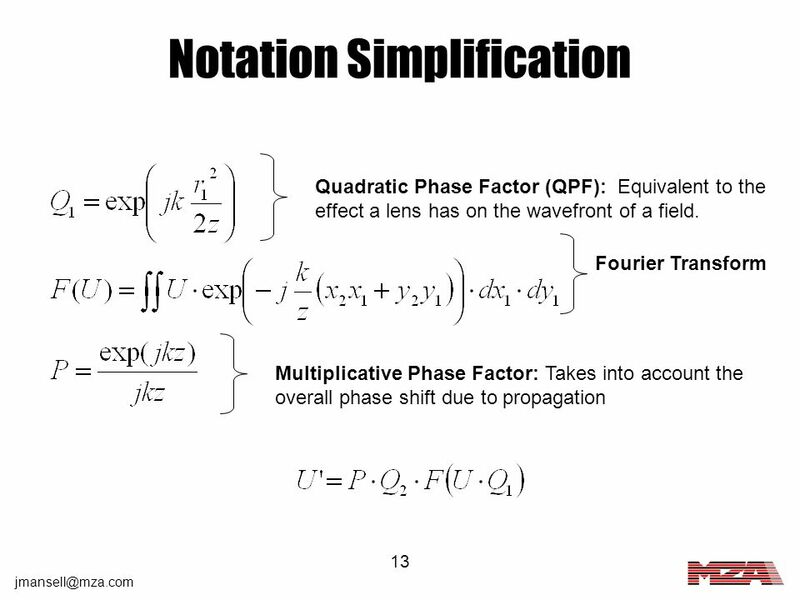 For equal apertures, this means a factor of two guard-band. 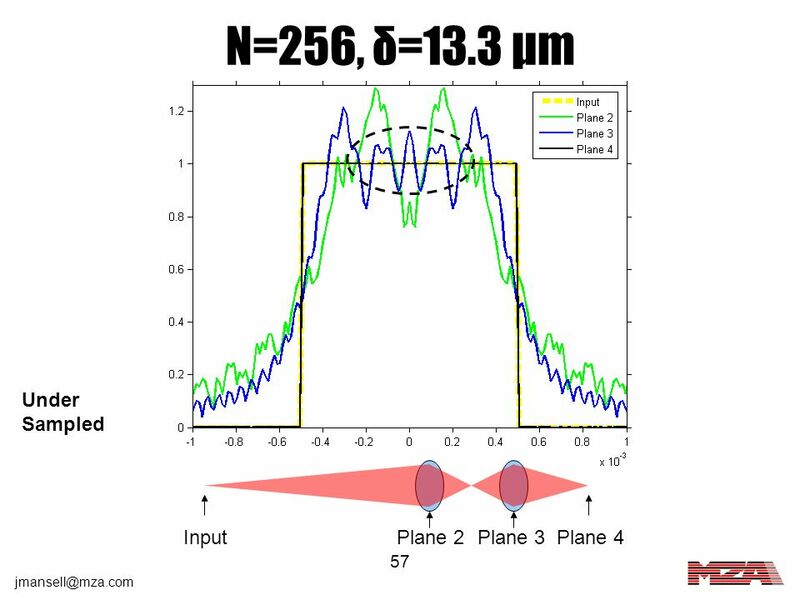 36 Unequal Apertures For unequal apertures (such as spherical-reference wave propagation), the same geometric argument can be made. 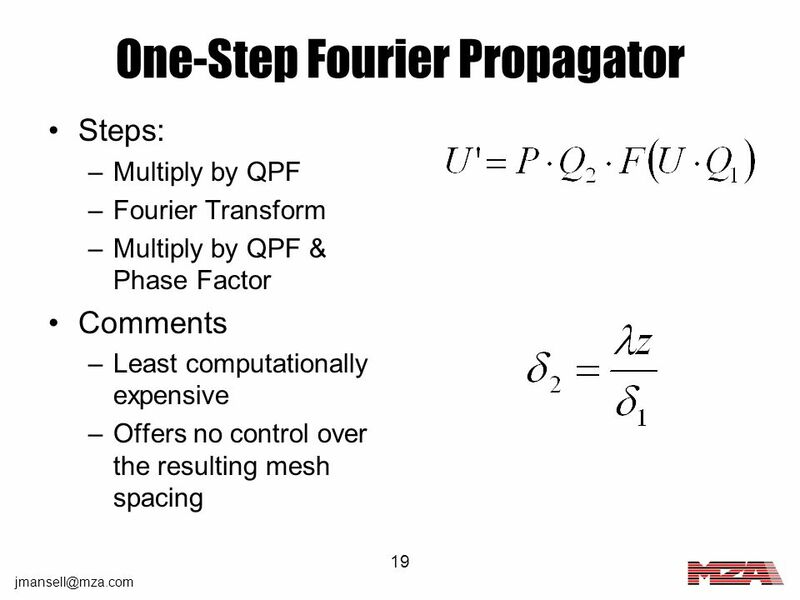 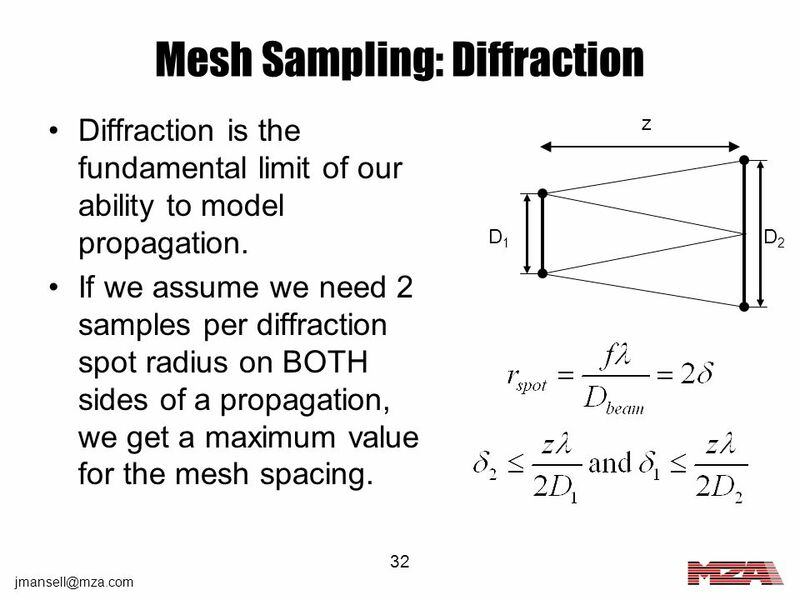 The resulting form can be thought of as the average of the number of mesh points required to cover each of the input apertures plus a diffractive term. 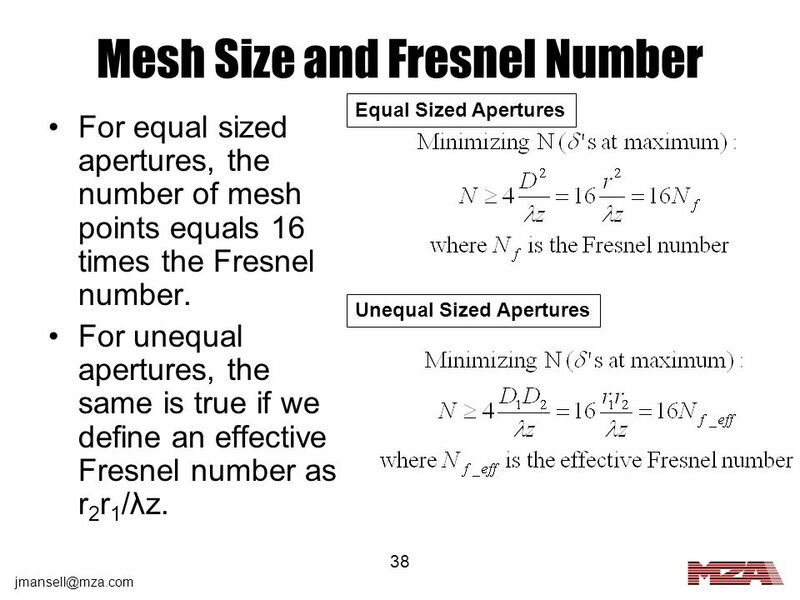 If we set the two mesh spacings to their maximum value, the number of mesh points reduces to a familiar form: the Fresnel number. 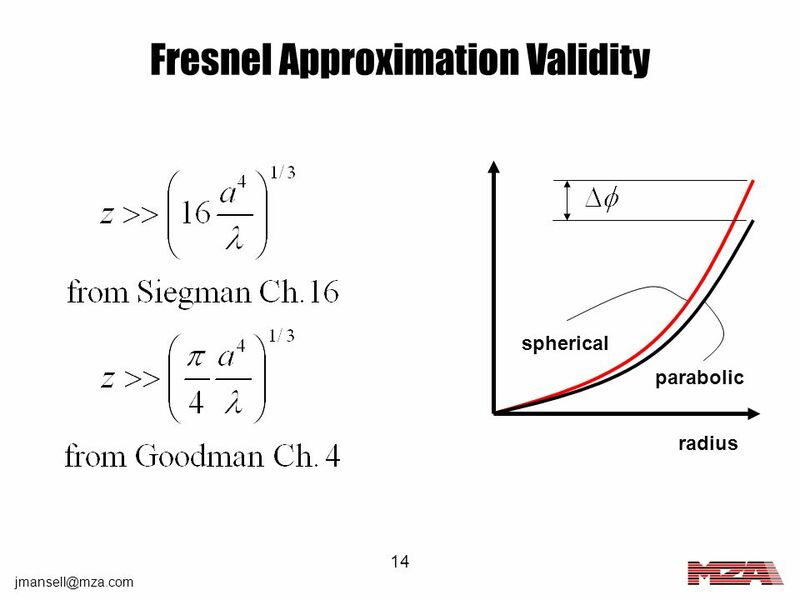 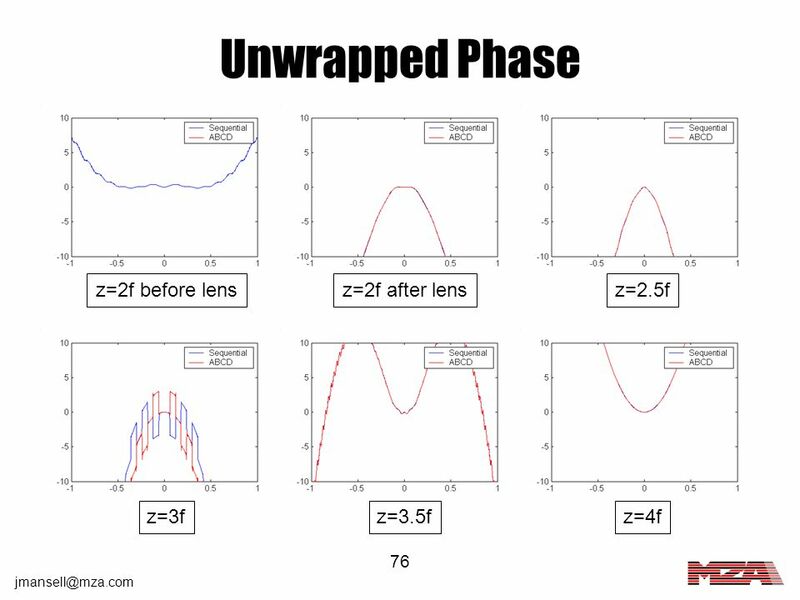 z The Fresnel number is the number of half waves of phase of a parabolic wavefront over the aperture. 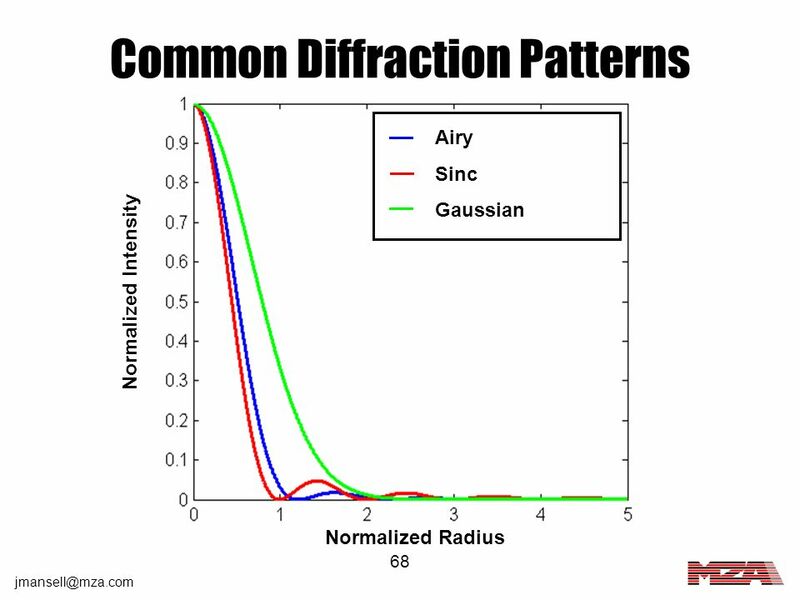 half the number of diffraction limited spots diameters over the aperture. 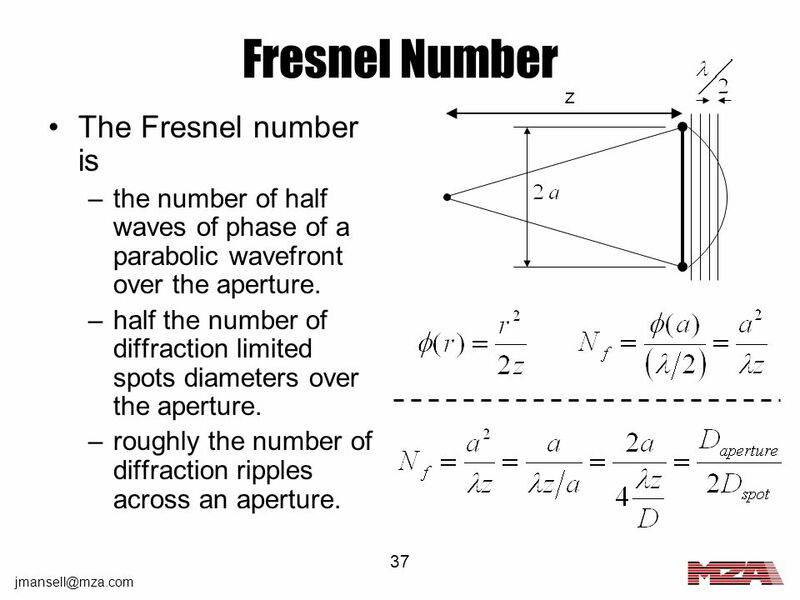 roughly the number of diffraction ripples across an aperture. 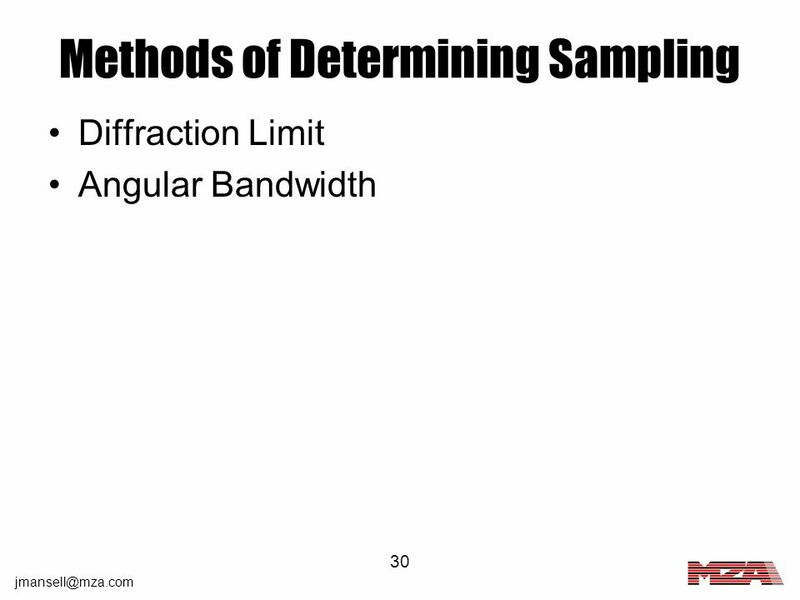 Mesh Sample Spacing Mesh Size Derived by either: Diffraction limit OR Required angular bandwidth Derived based on eliminating overlap between adjacent virtual apertures and the region of interest. 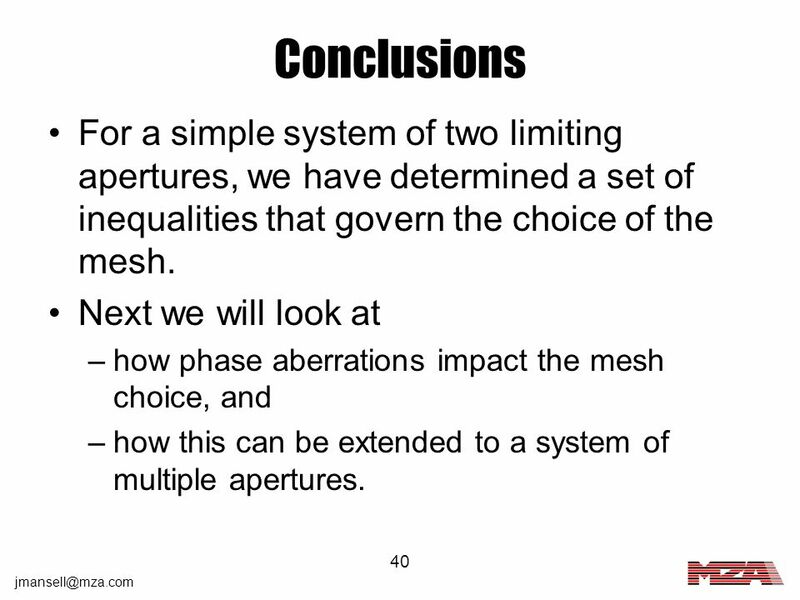 40 Conclusions For a simple system of two limiting apertures, we have determined a set of inequalities that govern the choice of the mesh. 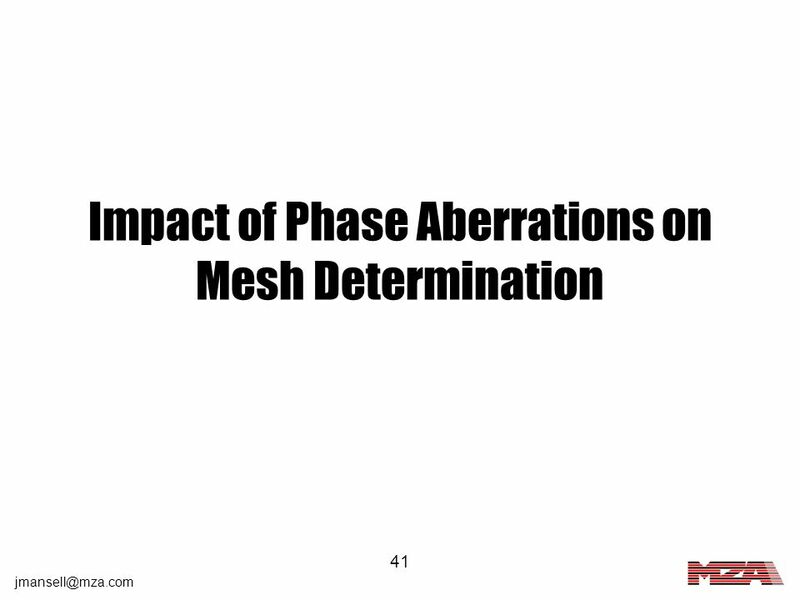 Next we will look at how phase aberrations impact the mesh choice, and how this can be extended to a system of multiple apertures. 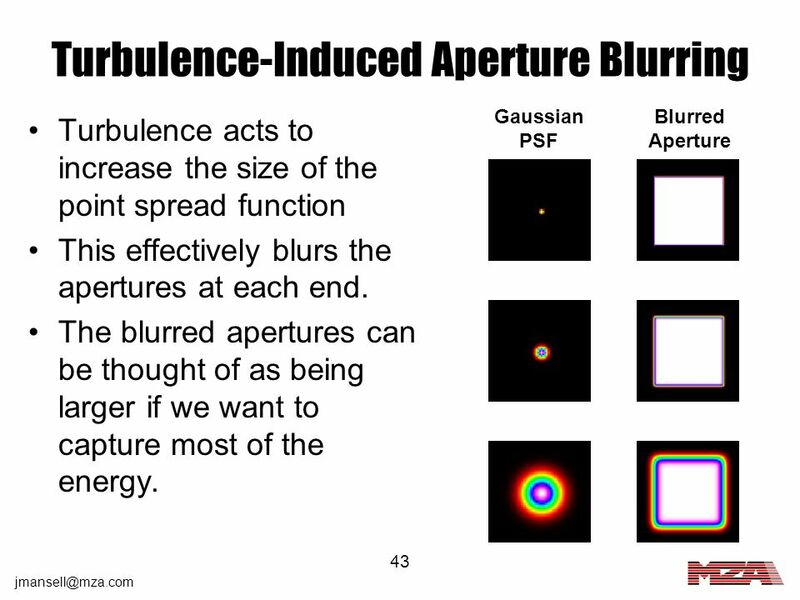 Gaussian PSF Blurred Aperture Turbulence acts to increase the size of the point spread function This effectively blurs the apertures at each end. 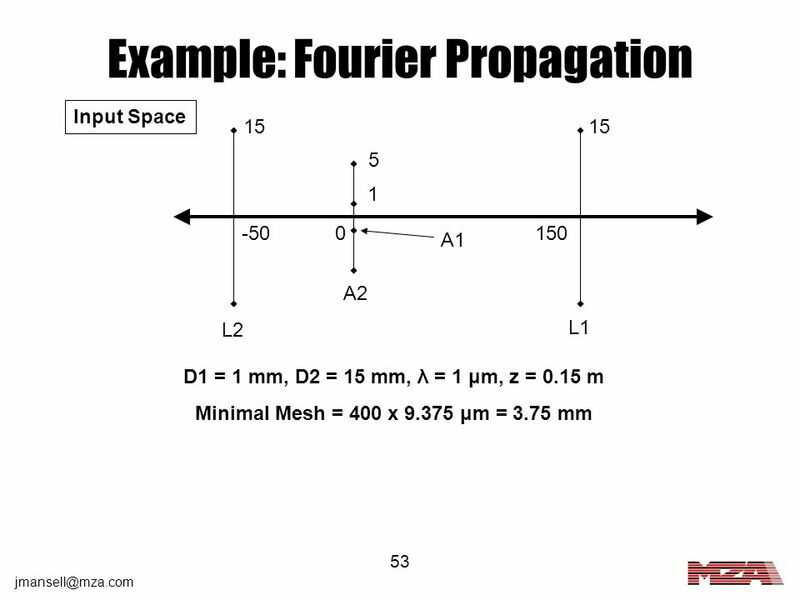 The blurred apertures can be thought of as being larger if we want to capture most of the energy. 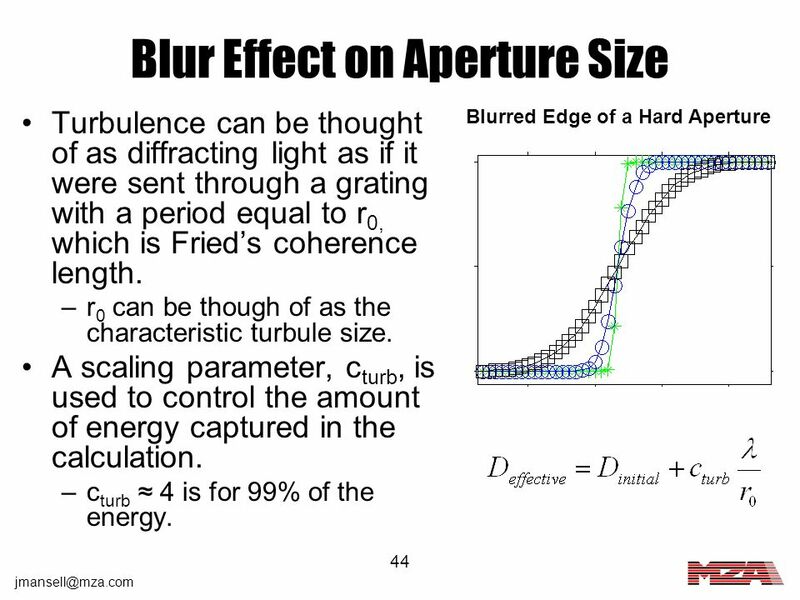 Blurred Edge of a Hard Aperture Turbulence can be thought of as diffracting light as if it were sent through a grating with a period equal to r0, which is Fried’s coherence length. 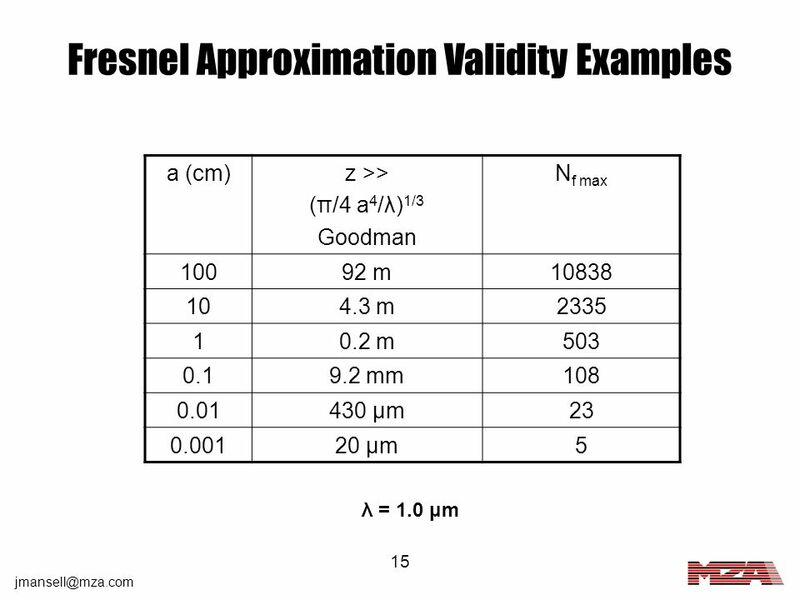 r0 can be though of as the characteristic turbule size. 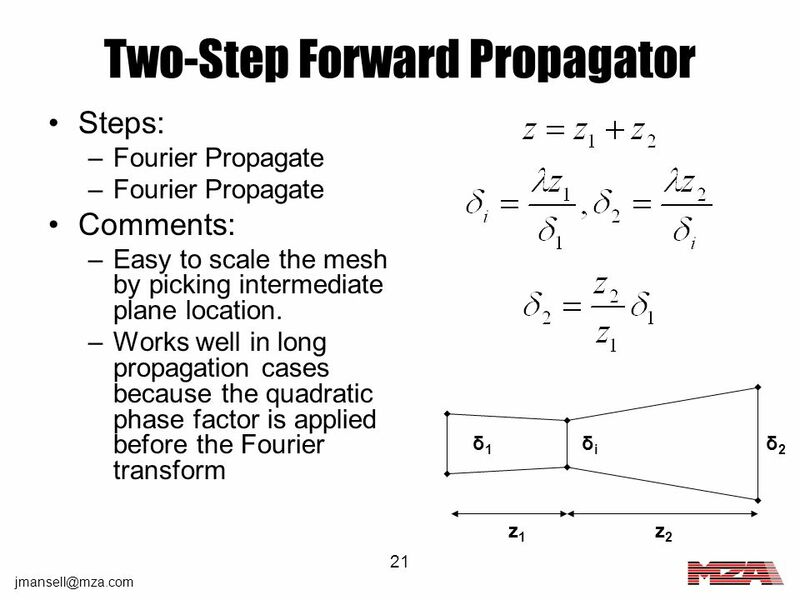 A scaling parameter, cturb, is used to control the amount of energy captured in the calculation. 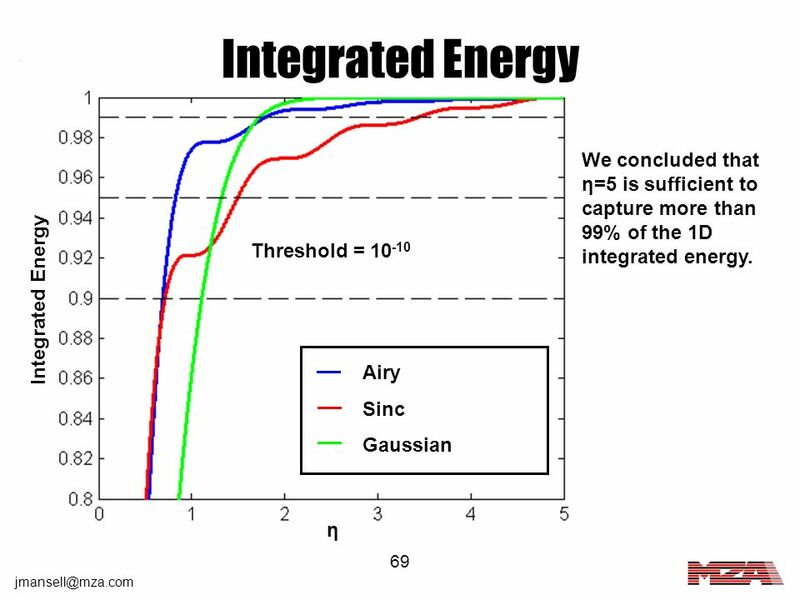 cturb ≈ 4 is for 99% of the energy. 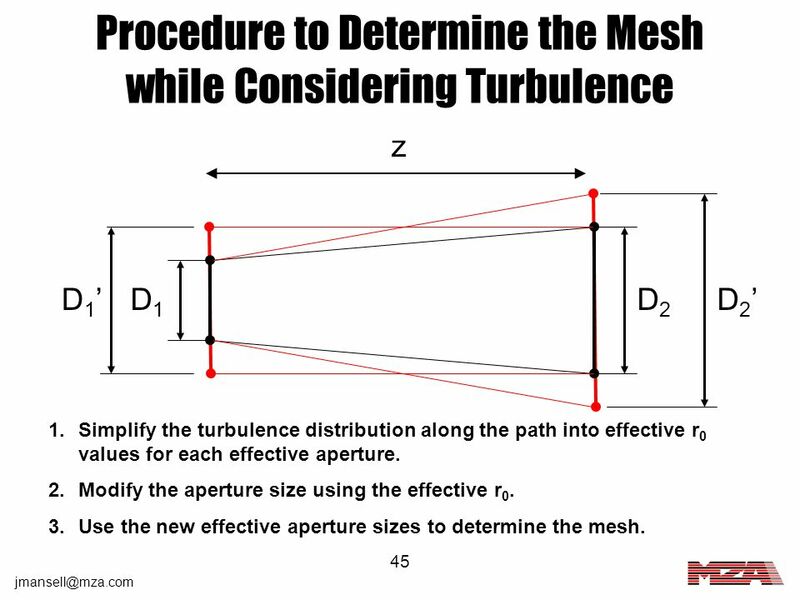 z D1’ D1 D2 D2’ Simplify the turbulence distribution along the path into effective r0 values for each effective aperture. 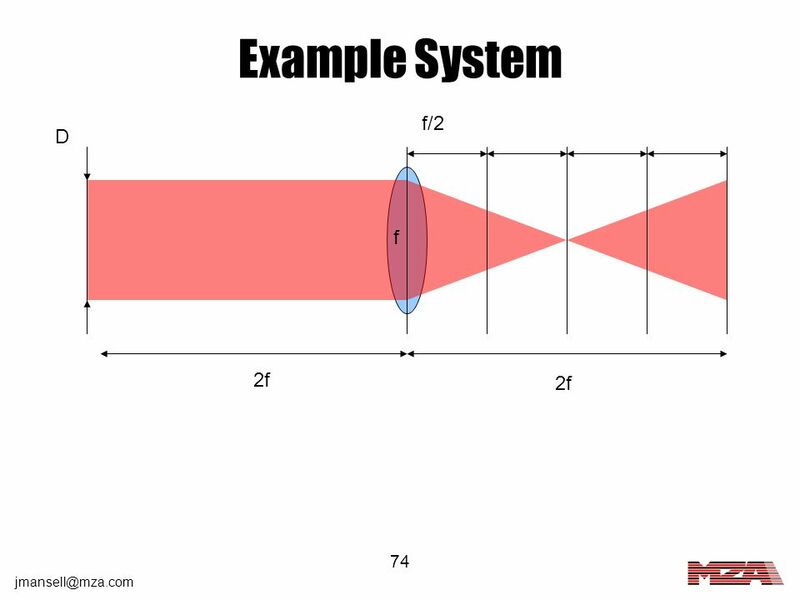 Modify the aperture size using the effective r0. 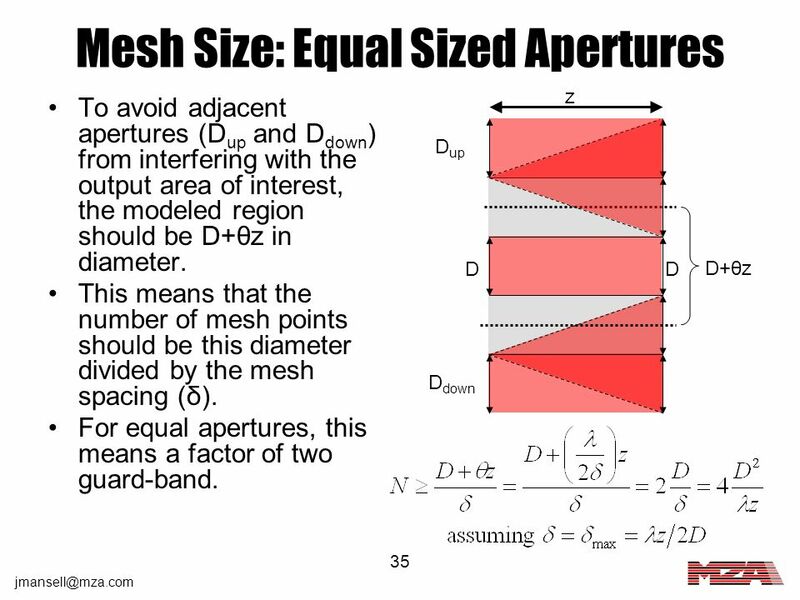 Use the new effective aperture sizes to determine the mesh. 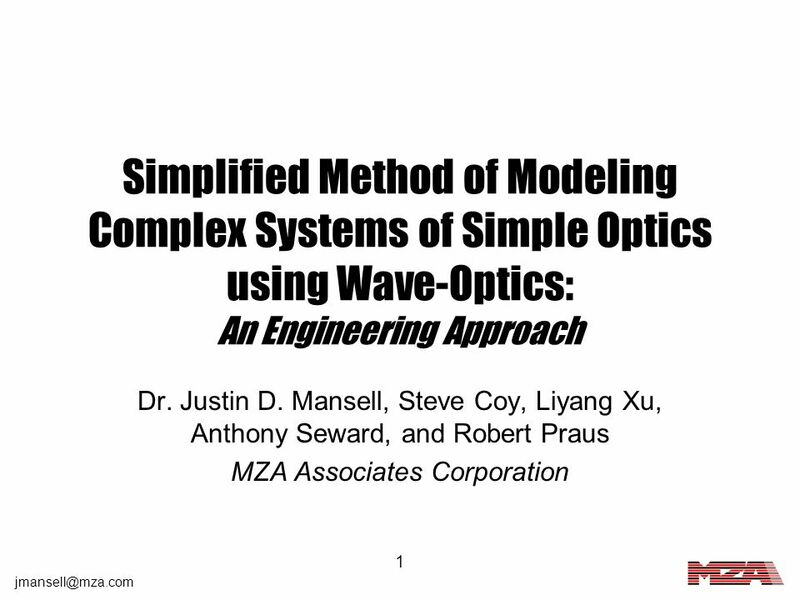 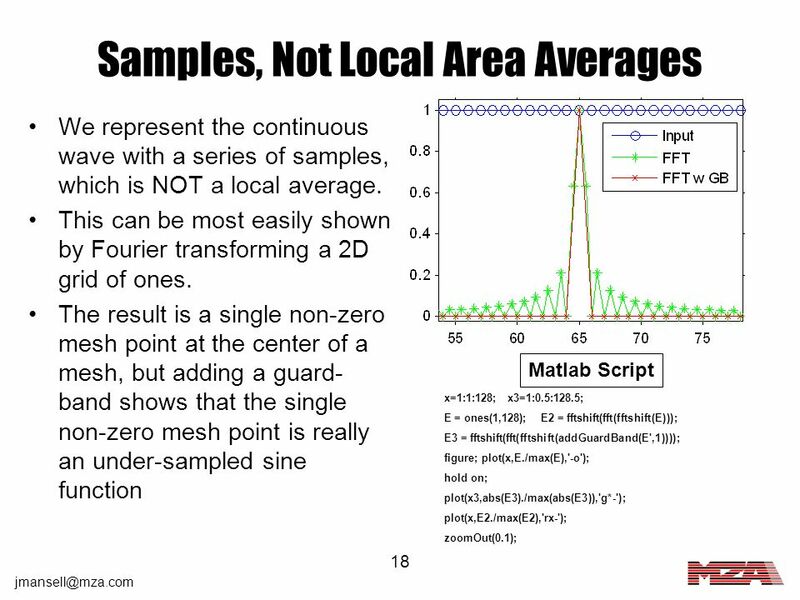 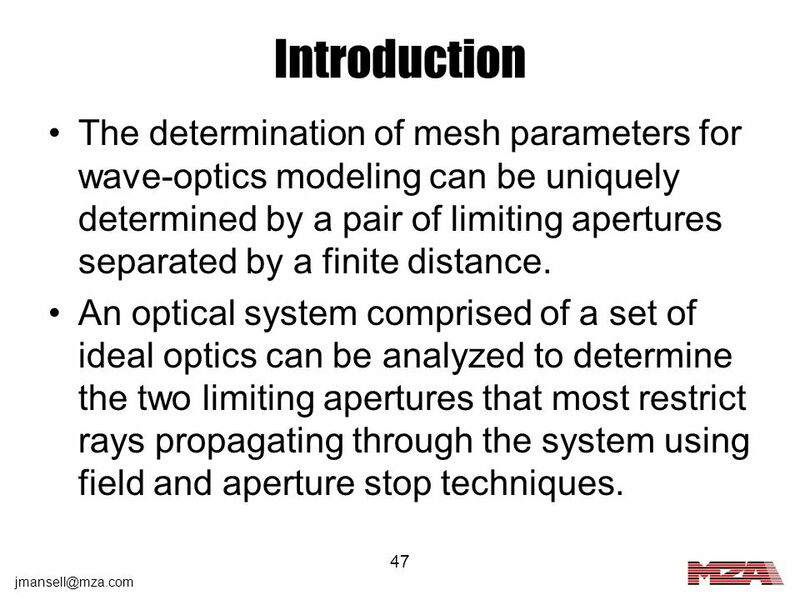 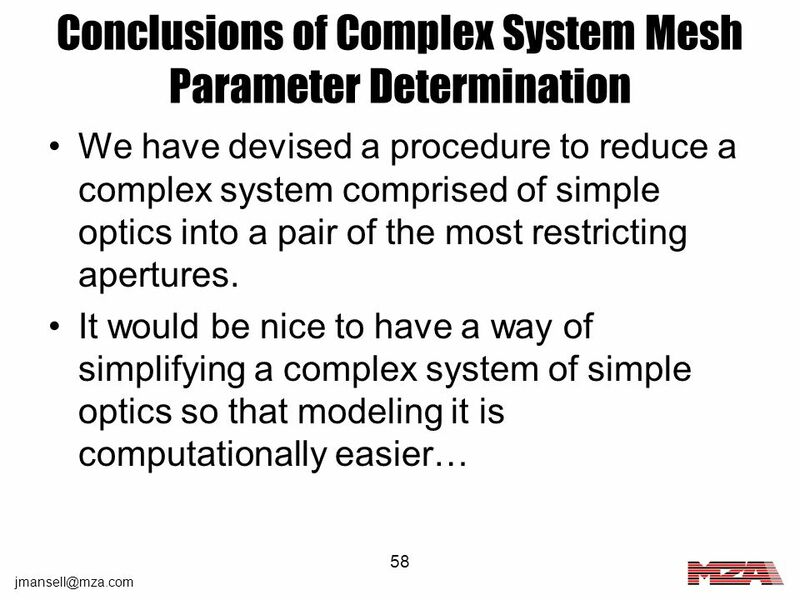 47 Introduction The determination of mesh parameters for wave-optics modeling can be uniquely determined by a pair of limiting apertures separated by a finite distance. 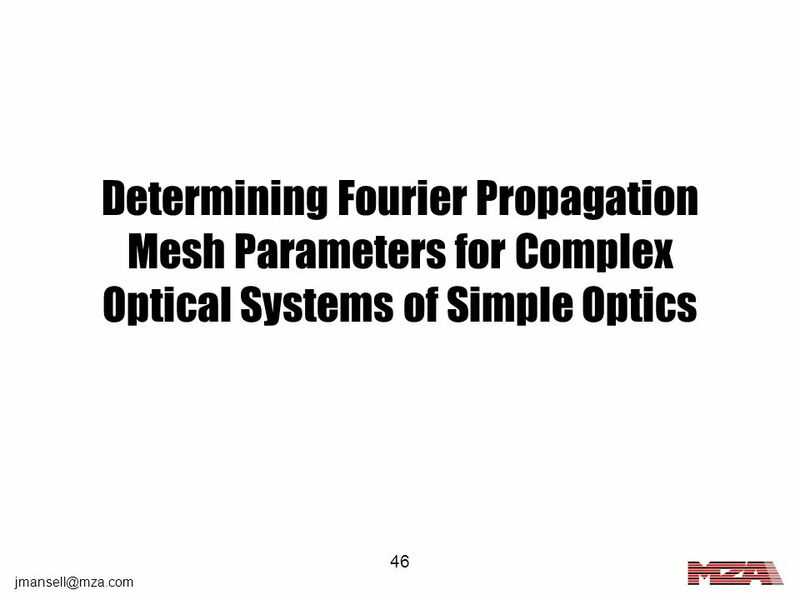 An optical system comprised of a set of ideal optics can be analyzed to determine the two limiting apertures that most restrict rays propagating through the system using field and aperture stop techniques. 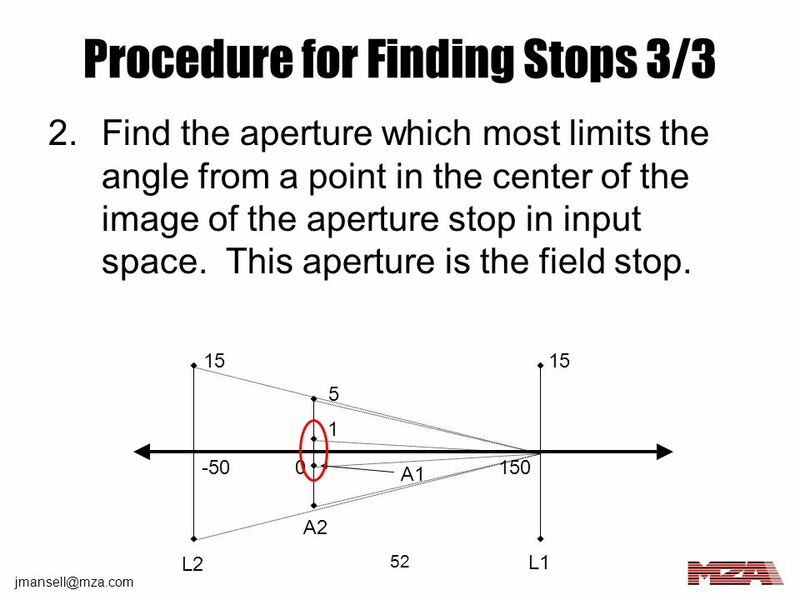 Aperture Stop = the aperture in a system that limits the cone of energy from a point on the optical axis. 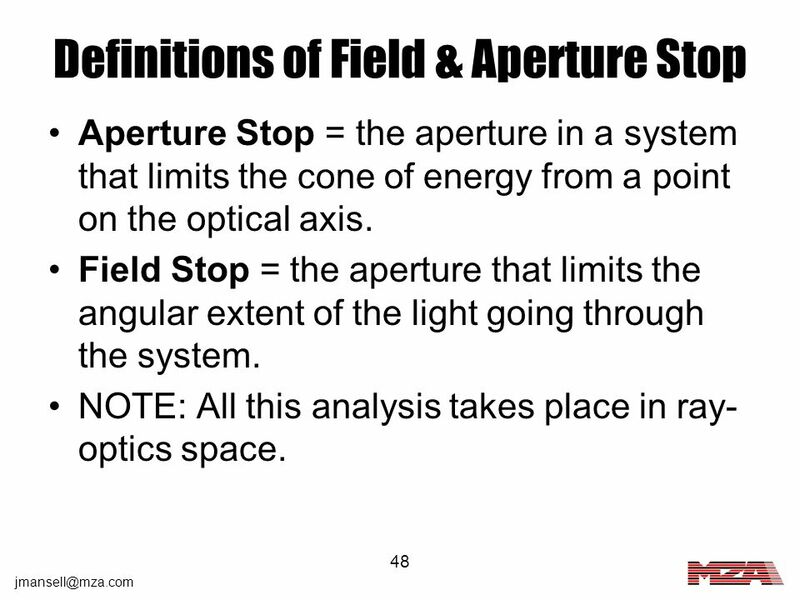 Field Stop = the aperture that limits the angular extent of the light going through the system. 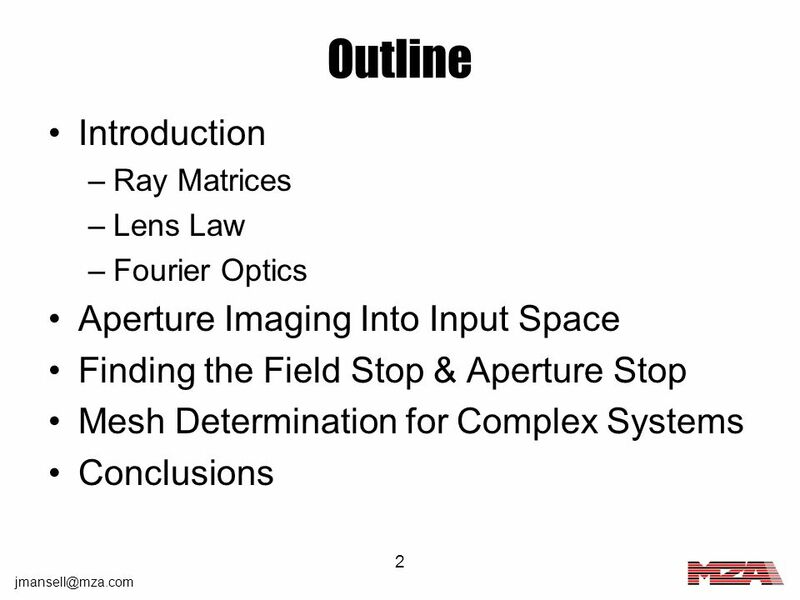 NOTE: All this analysis takes place in ray-optics space. 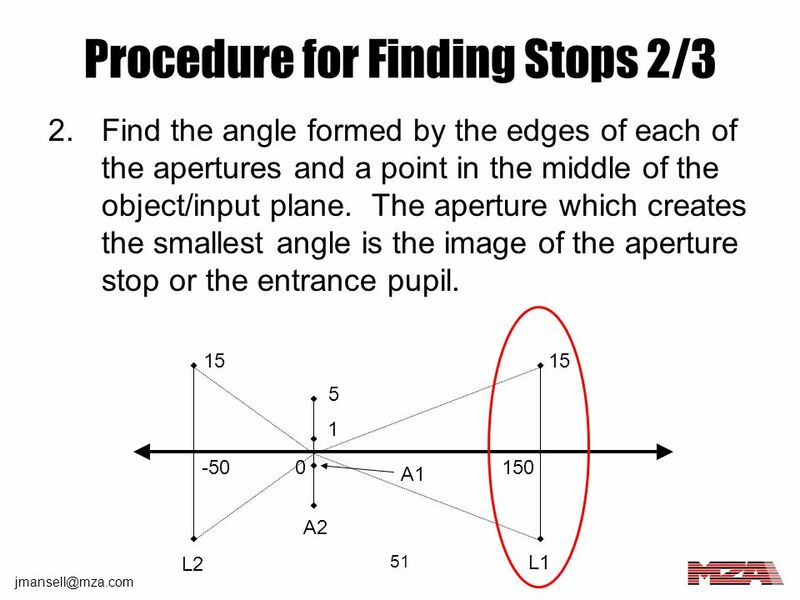 Find the location and size of each aperture in input space. 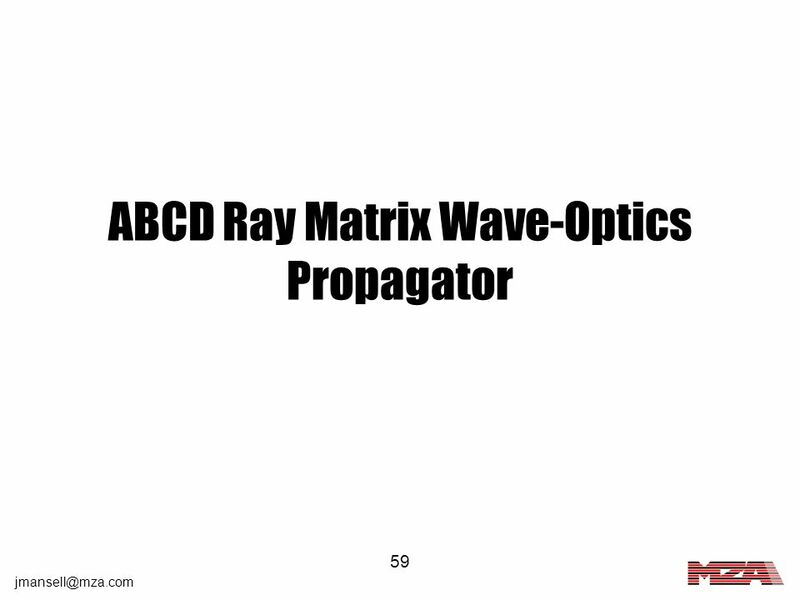 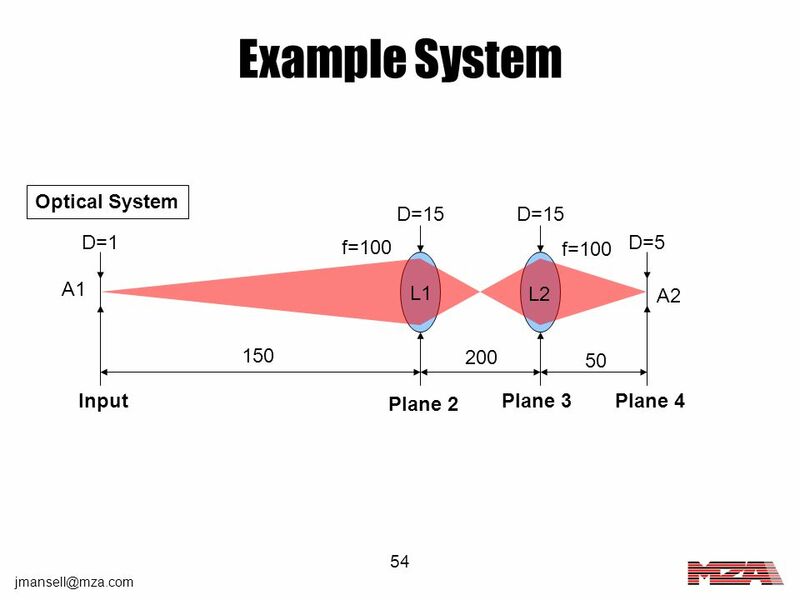 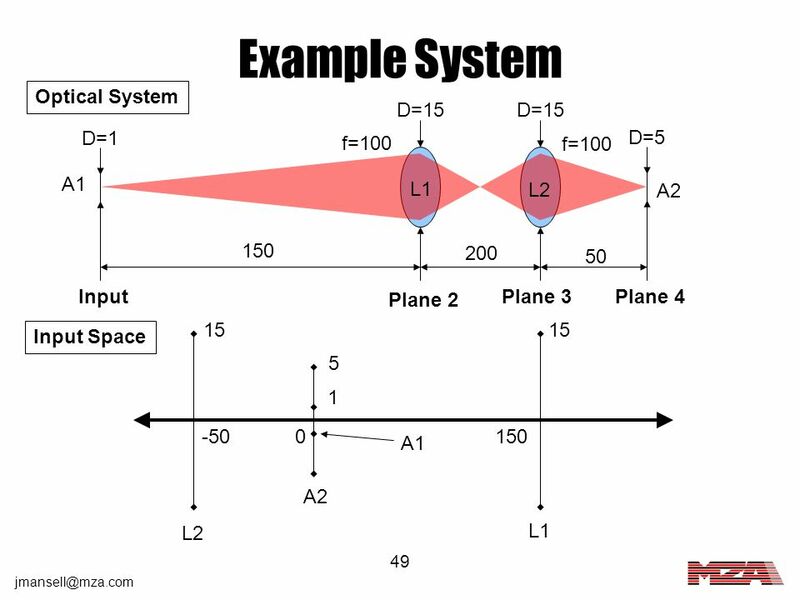 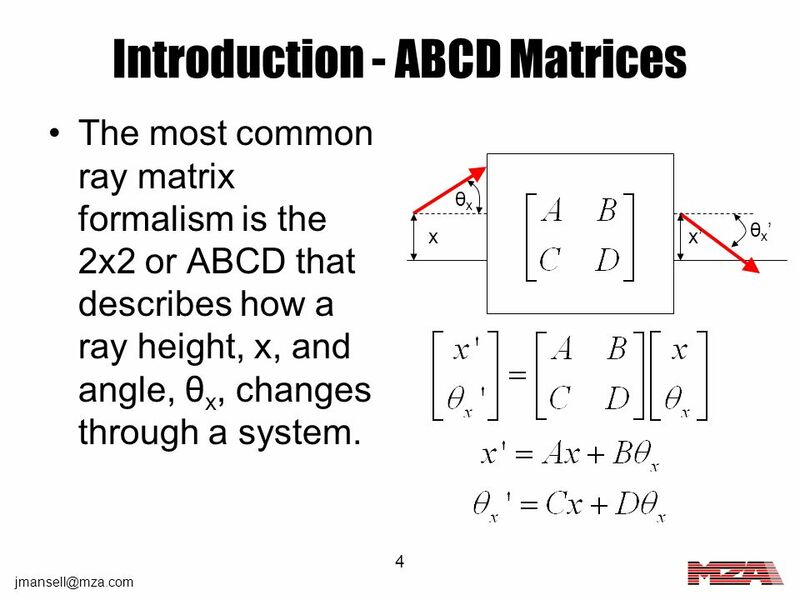 Find the ABCD matrix from the input of the system to each optic in the system. 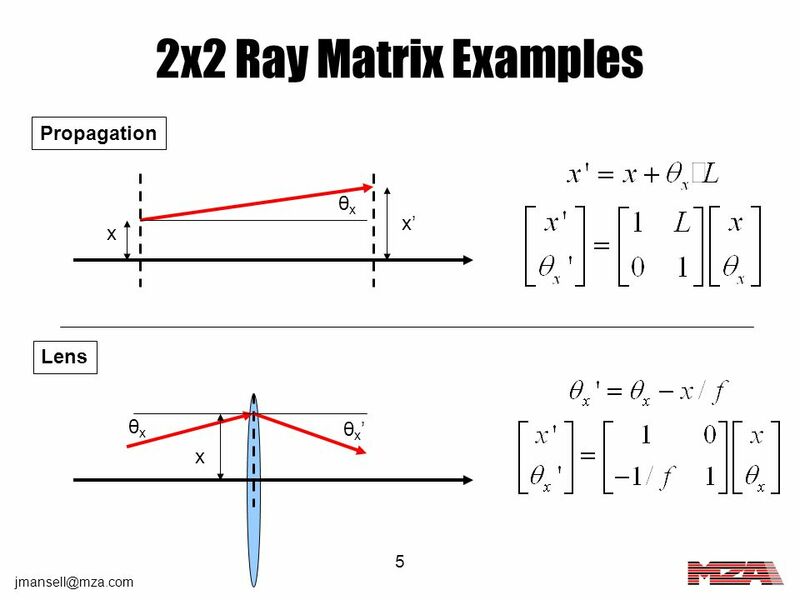 Solve for the distance (zimage) required to drive the B term to zero by inverting the input-space to aperture ray matrix. 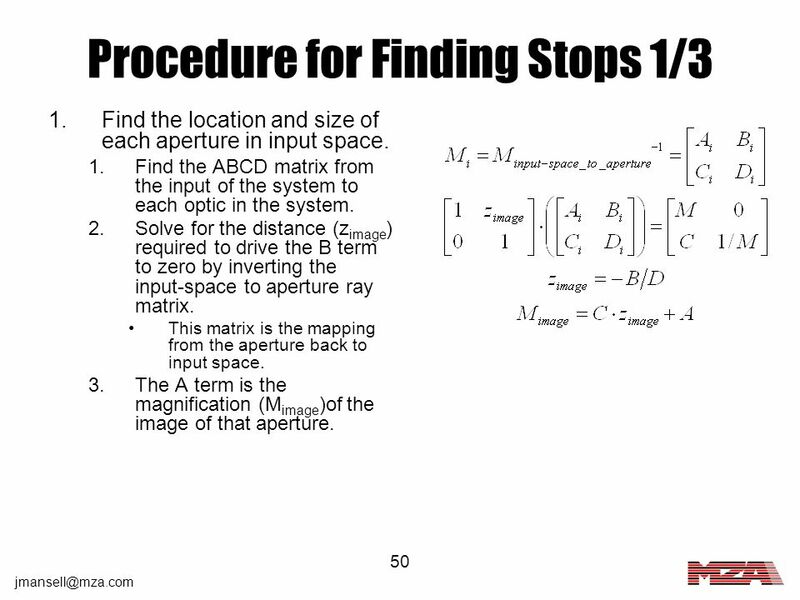 This matrix is the mapping from the aperture back to input space. 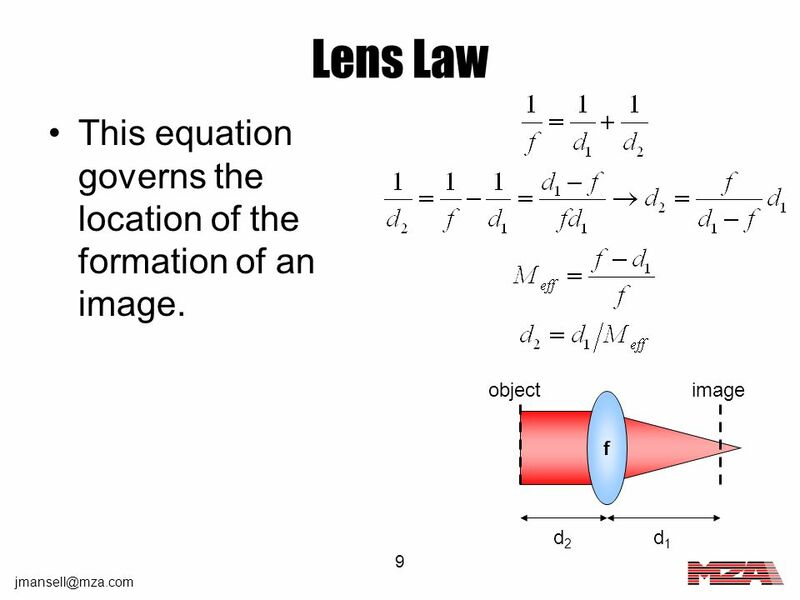 The A term is the magnification (Mimage)of the image of that aperture. 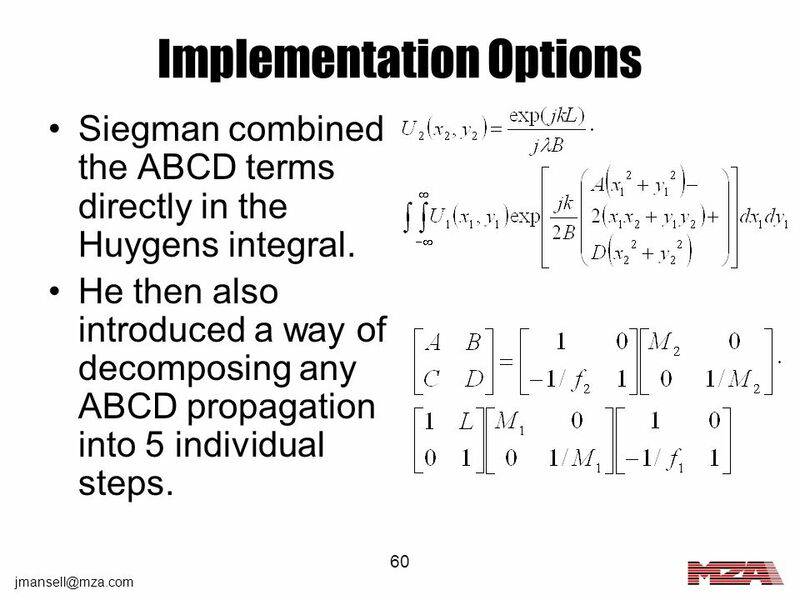 Siegman combined the ABCD terms directly in the Huygens integral. 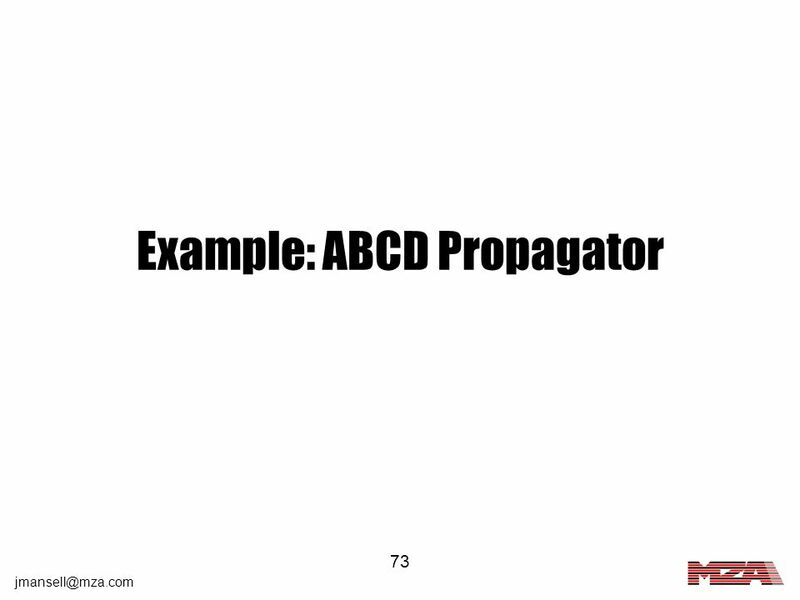 He then also introduced a way of decomposing any ABCD propagation into 5 individual steps. 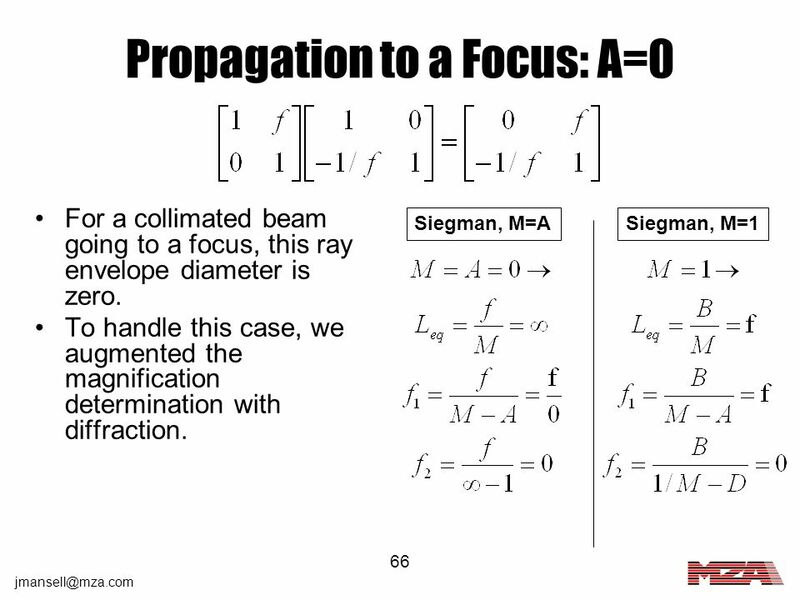 We found that one of the magnification terms was unnecessary (M1=1.0). 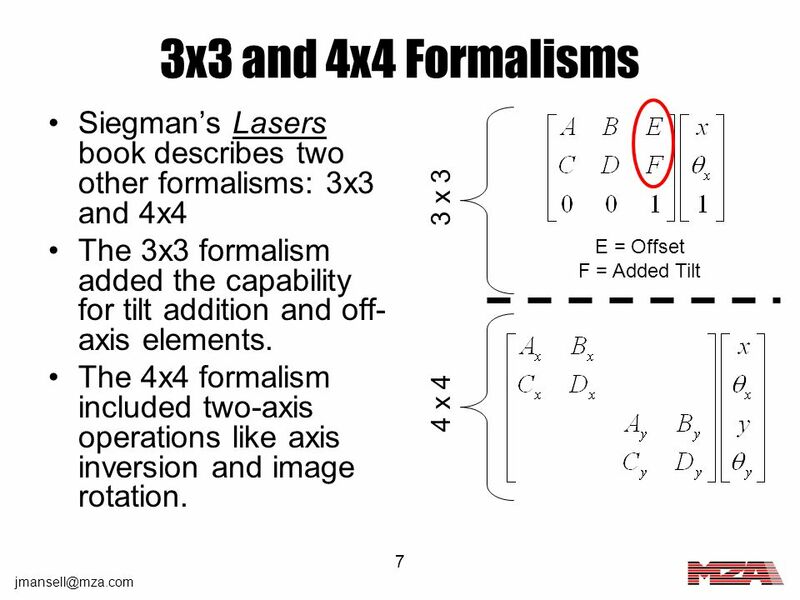 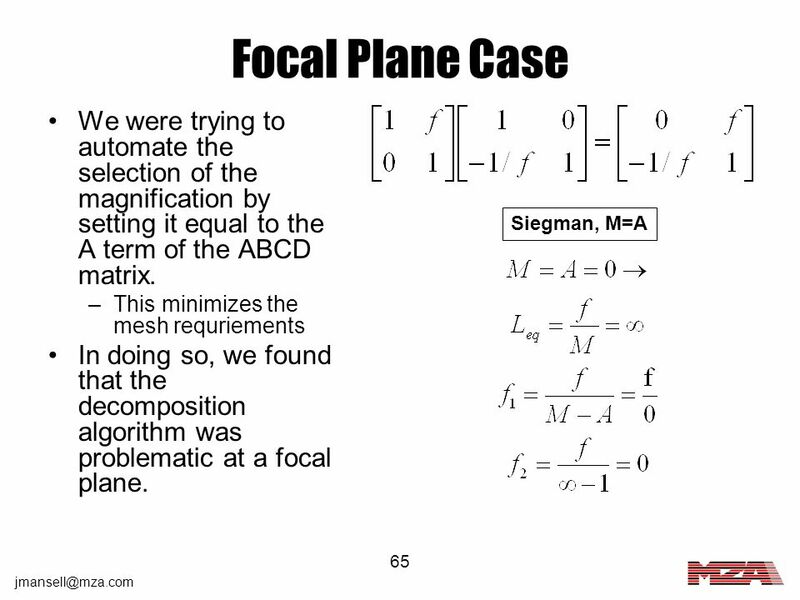 Siegman’s algorithm did not address two important situations: image planes and focal planes. 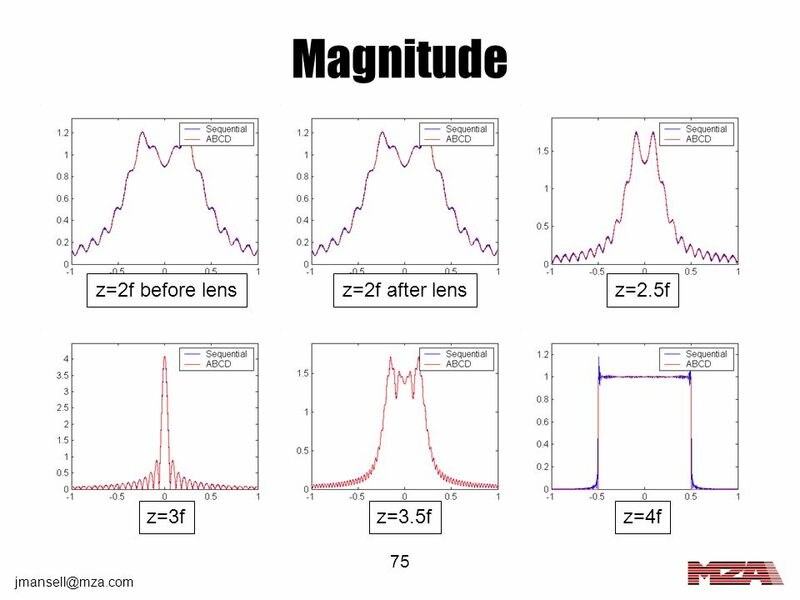 We worked a bit more on how to pick an appropriate magnification when considering diffraction. 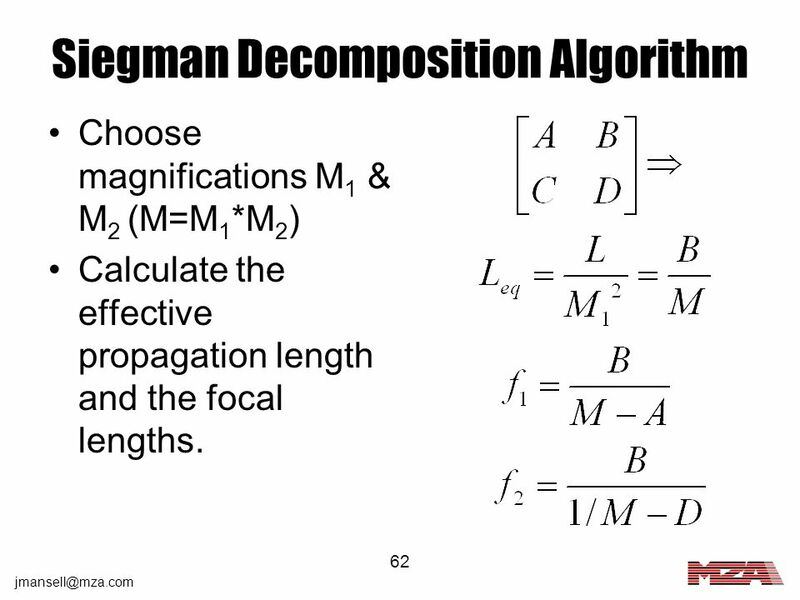 Choose magnifications M1 & M2 (M=M1*M2) Calculate the effective propagation length and the focal lengths. 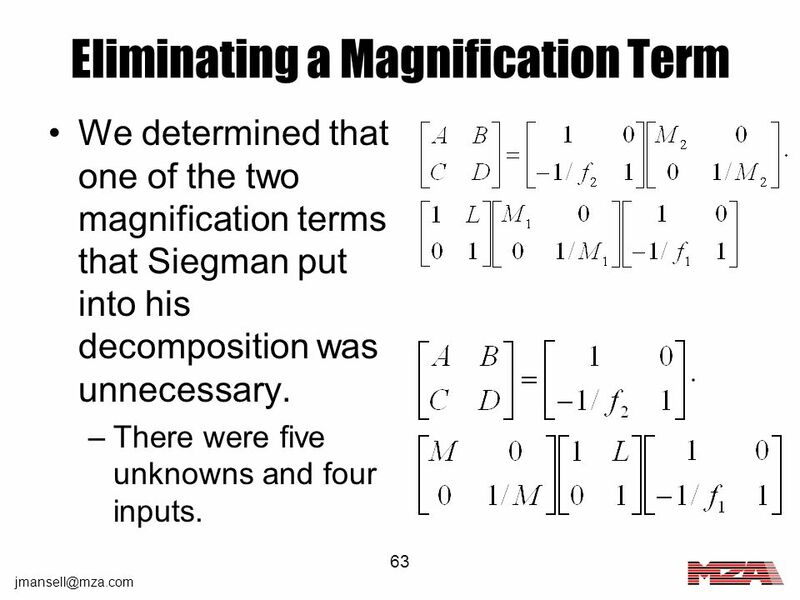 We determined that one of the two magnification terms that Siegman put into his decomposition was unnecessary. 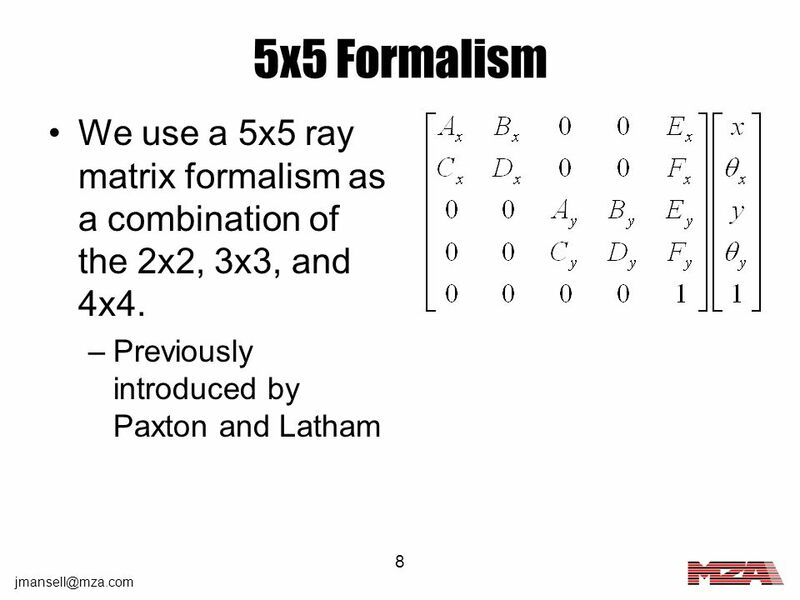 There were five unknowns and four inputs. 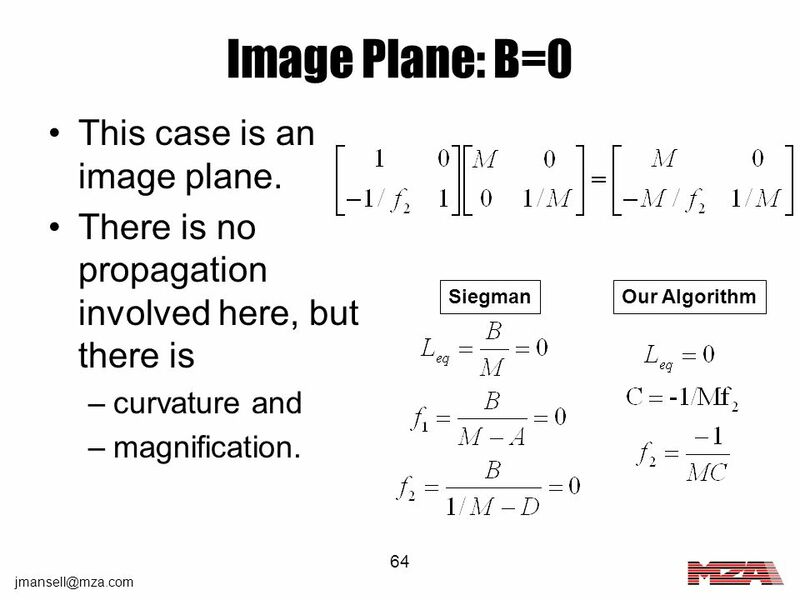 64 Image Plane: B=0 This case is an image plane. 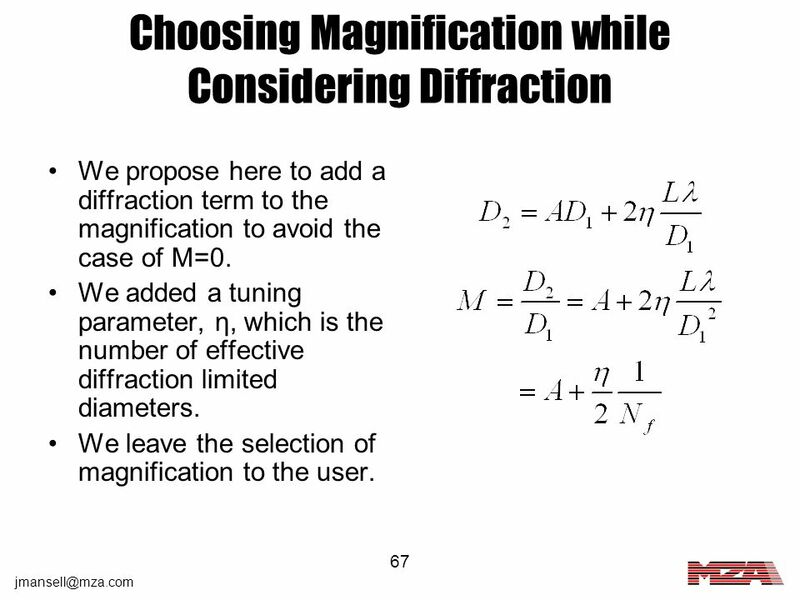 We propose here to add a diffraction term to the magnification to avoid the case of M=0. 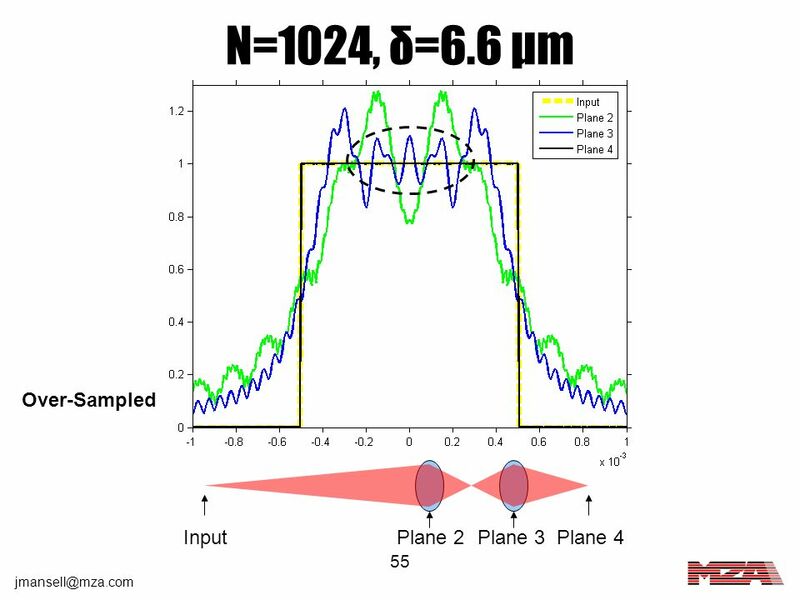 We added a tuning parameter, η, which is the number of effective diffraction limited diameters. 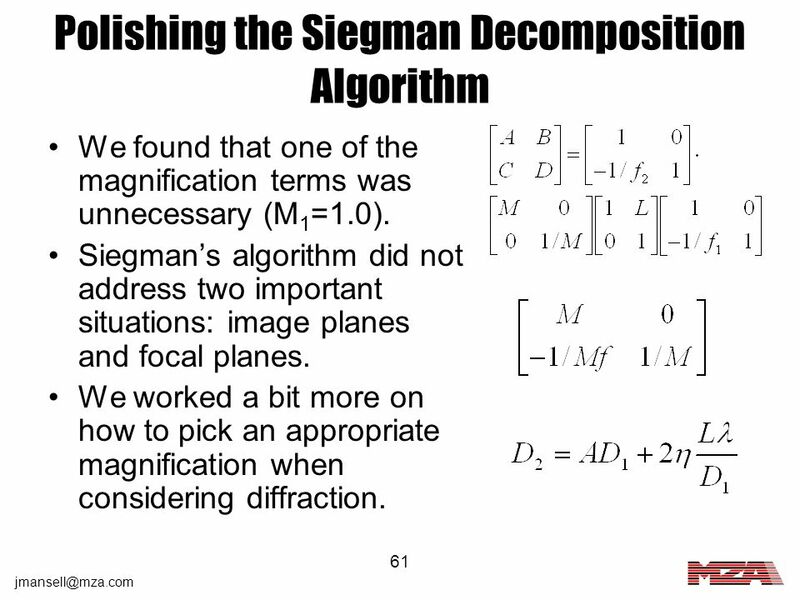 We leave the selection of magnification to the user. 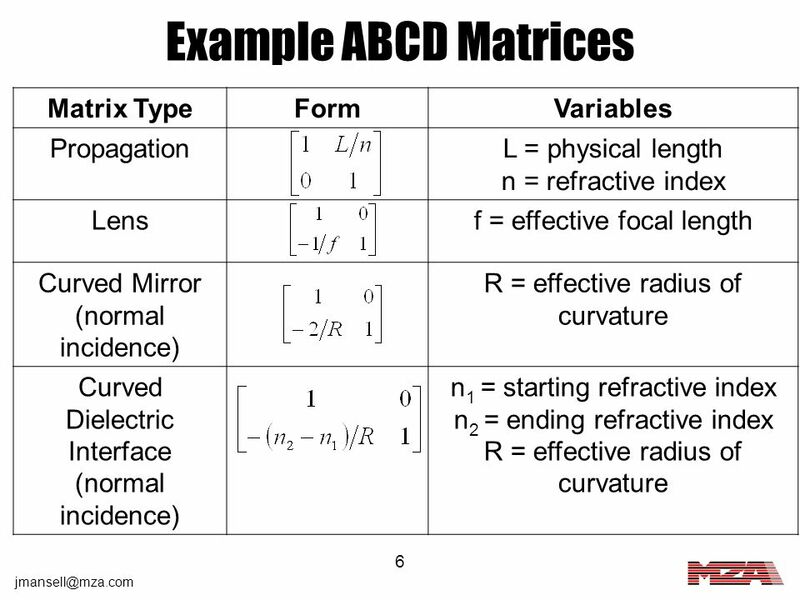 If at an image plane (B=0) M=A (possible need for interpolation) Apply focus Else Specify M, considering diffraction if necessary Calculate and apply the effective propagation length and the focal lengths. 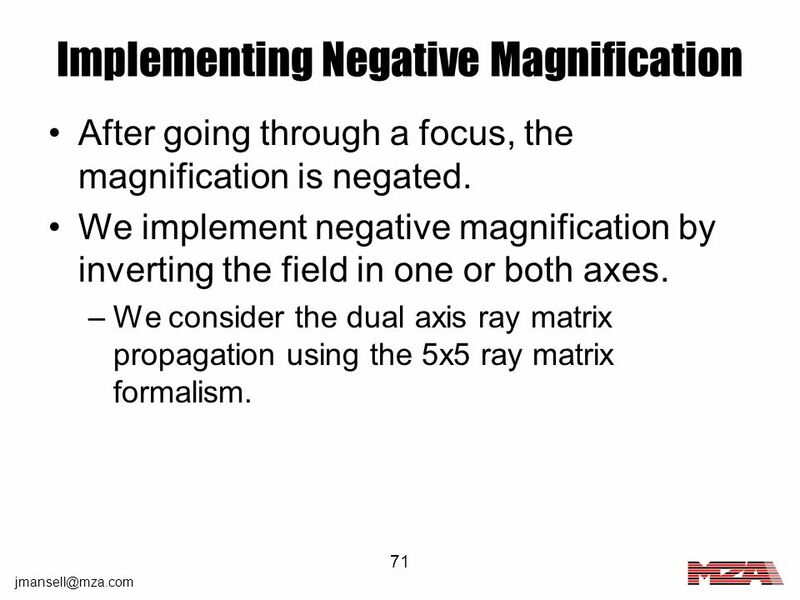 After going through a focus, the magnification is negated. 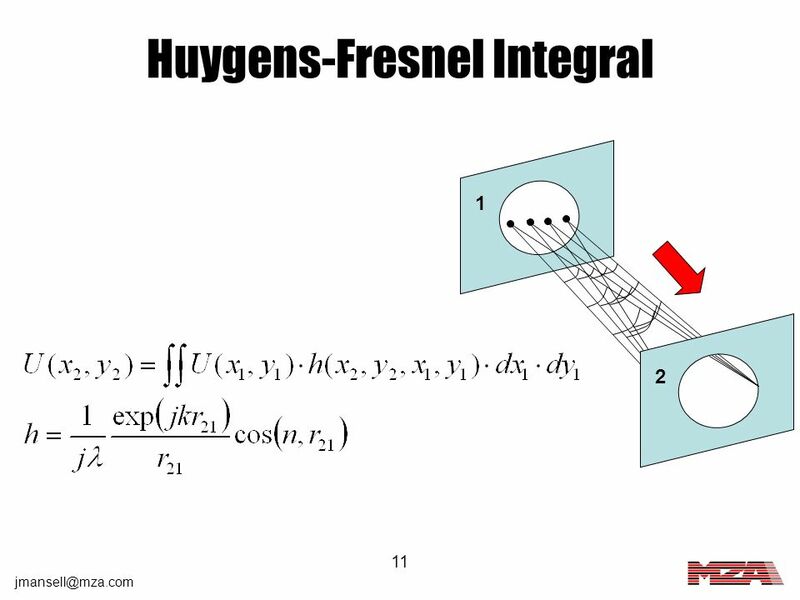 We implement negative magnification by inverting the field in one or both axes. 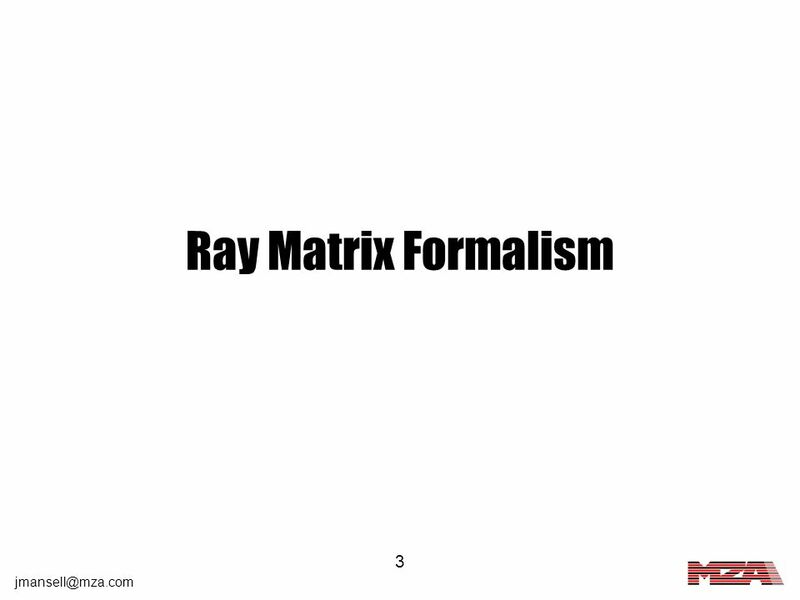 We consider the dual axis ray matrix propagation using the 5x5 ray matrix formalism. 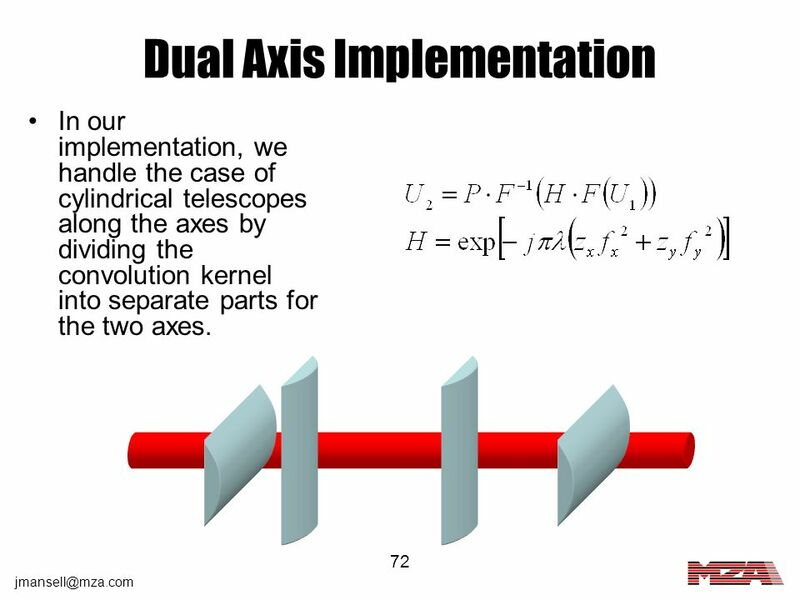 In our implementation, we handle the case of cylindrical telescopes along the axes by dividing the convolution kernel into separate parts for the two axes. 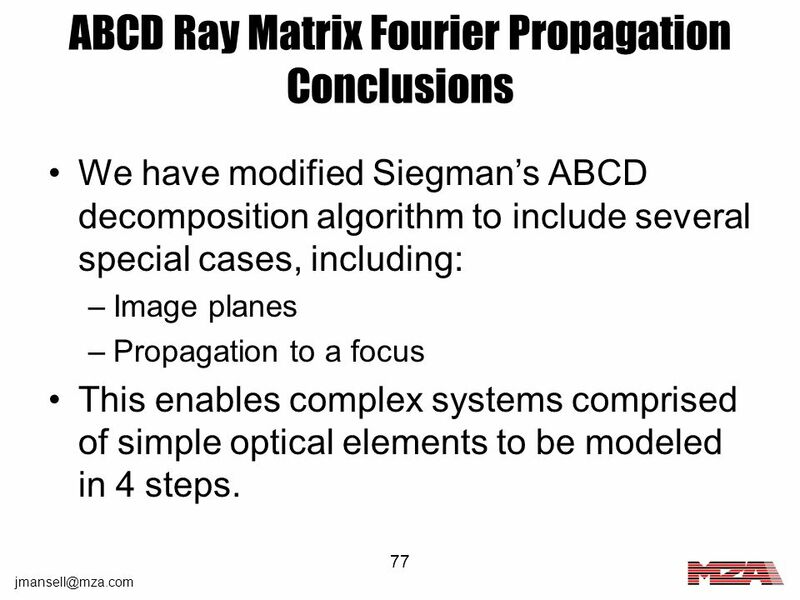 We have modified Siegman’s ABCD decomposition algorithm to include several special cases, including: Image planes Propagation to a focus This enables complex systems comprised of simple optical elements to be modeled in 4 steps. 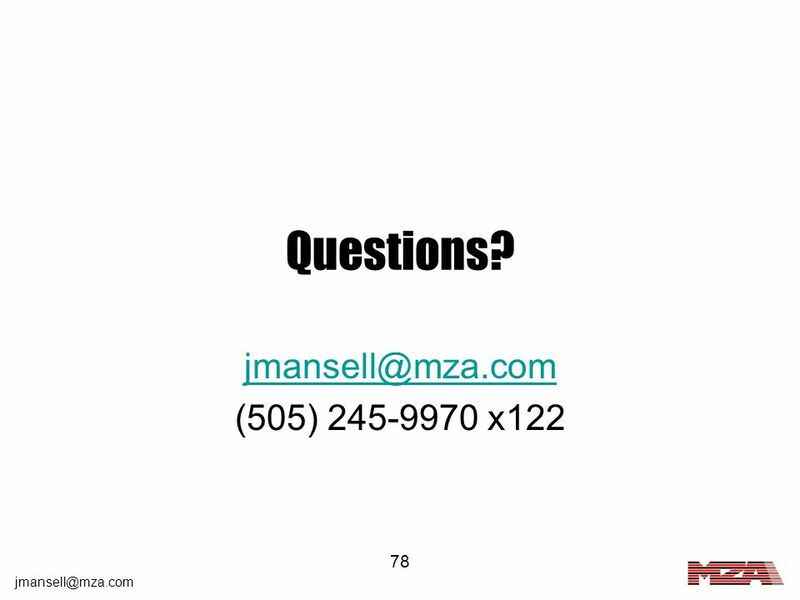 Download ppt "MZA Associates Corporation"